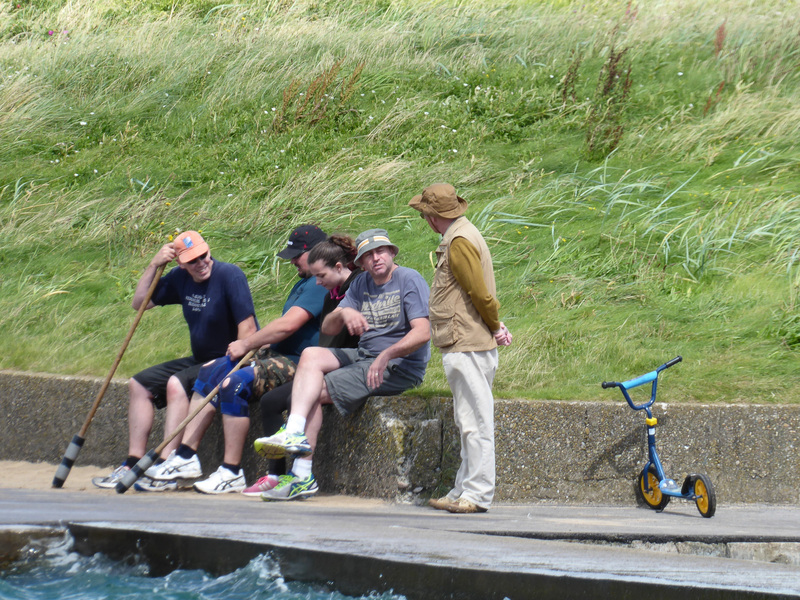 Yes, more pictures! 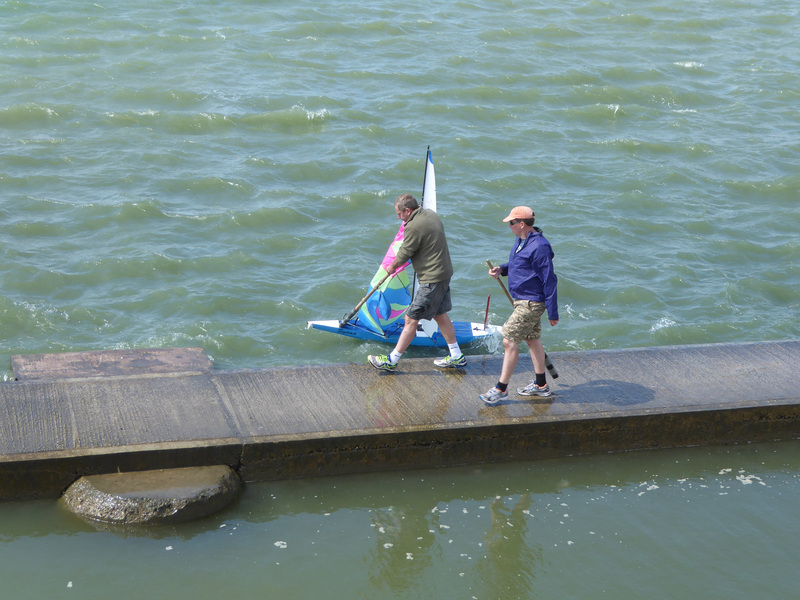 This stuff doesn’t happen very often so we might as well send it all out. 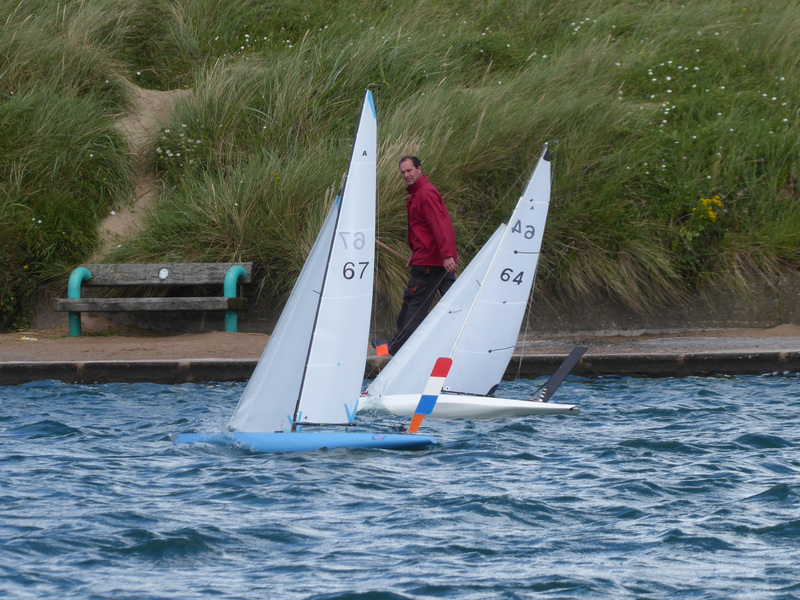 Thanks to Bob Jolly for the pictures. 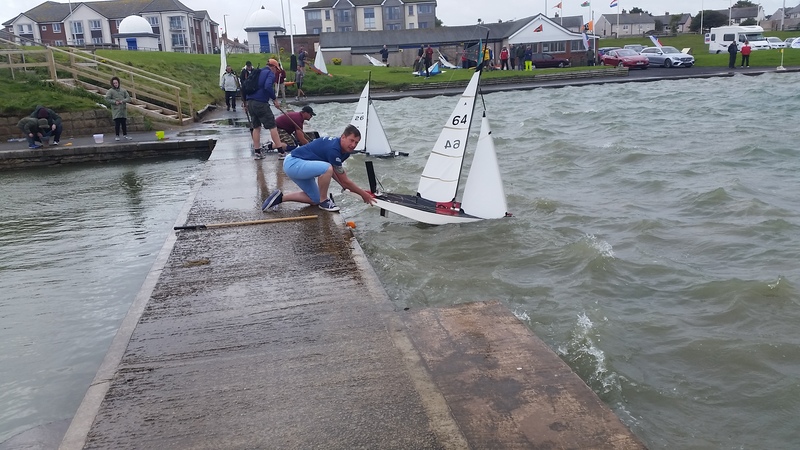 Fleetwood Model Yacht & Power Boat Club hosted the MYA National Championships for Vane-steered “A” Class Yachts from Sunday 30th July to Friday 4th August 2017 ( inclusive). 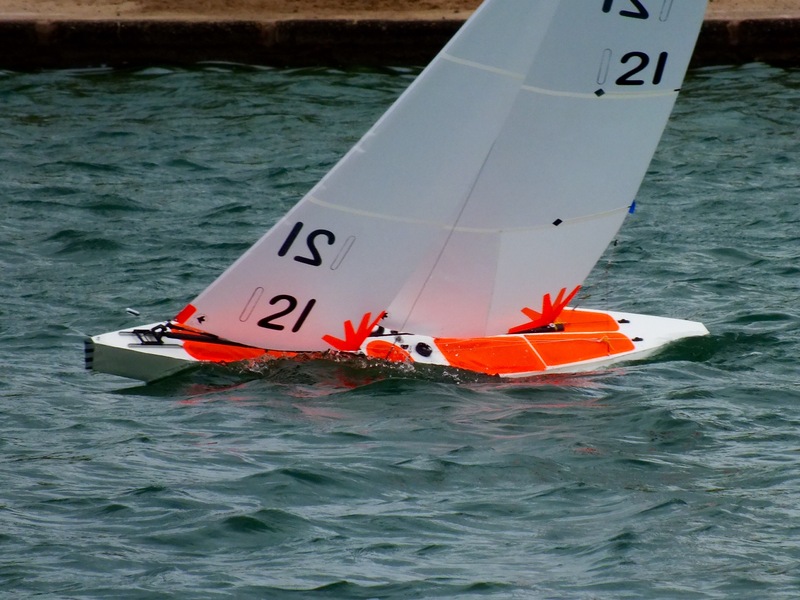 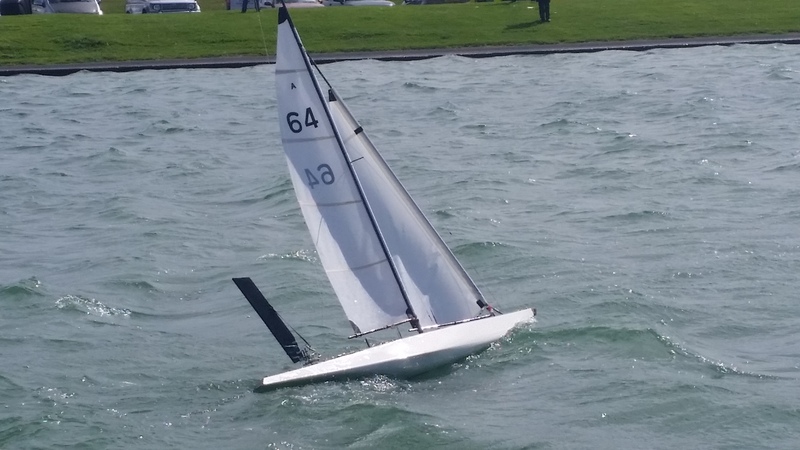 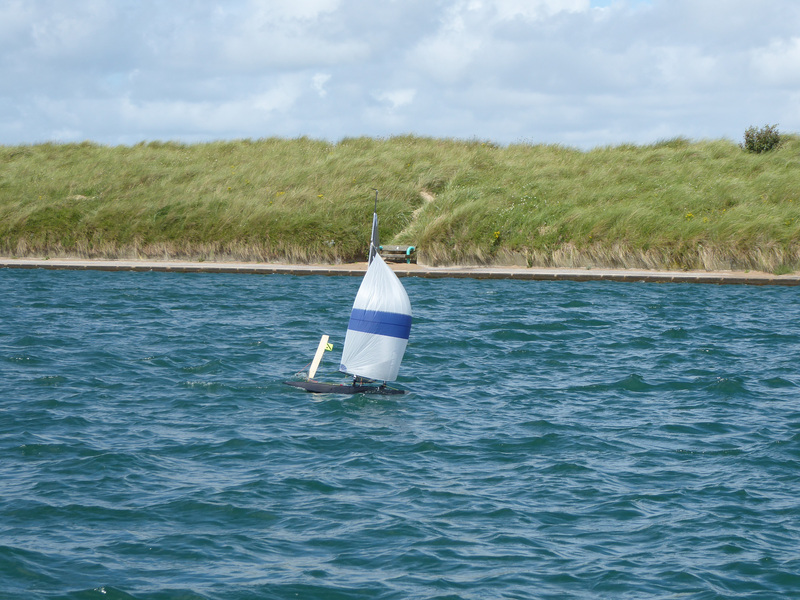 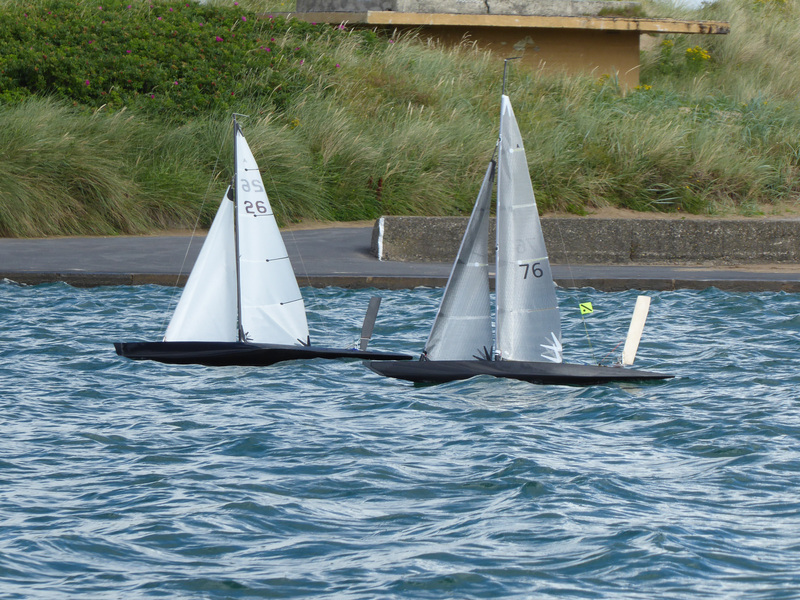 These yachts are up to 8 feet long and 9 feet tall and do not have radio control. 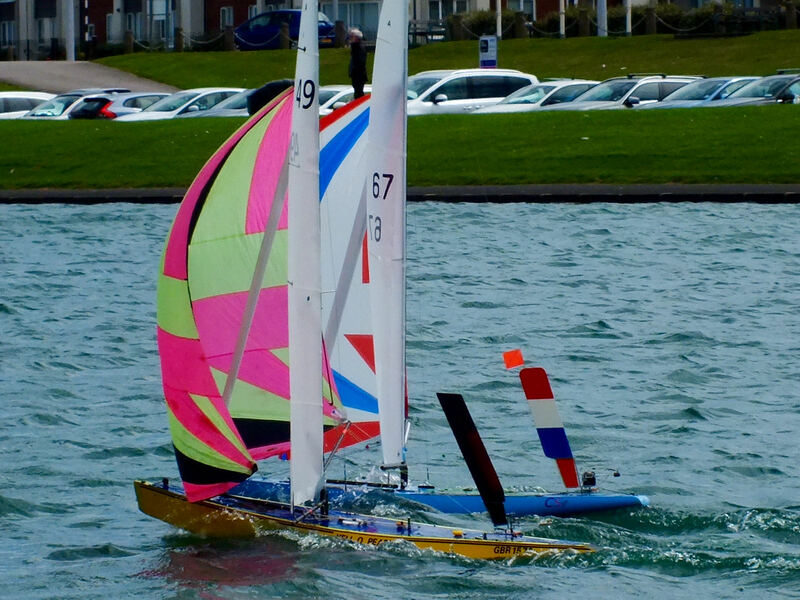 Competitors came from all over the UK, including Birkenhead, Clapham, Leeds and Bradford, Gosport, four yachts from Fleetwood and also one from Holland. 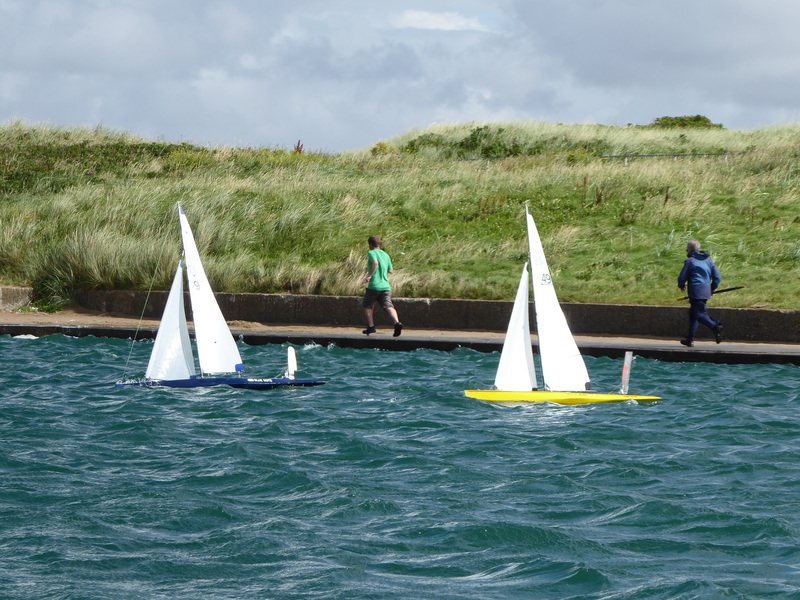 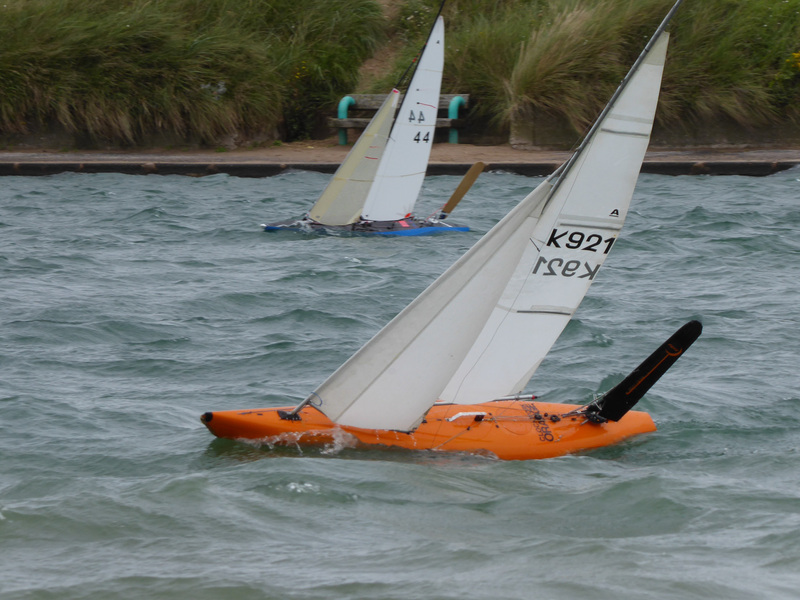 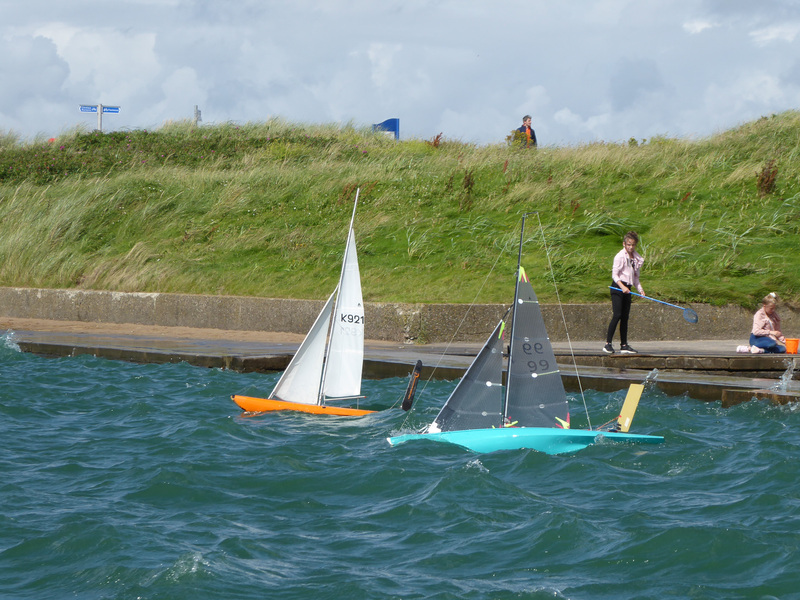 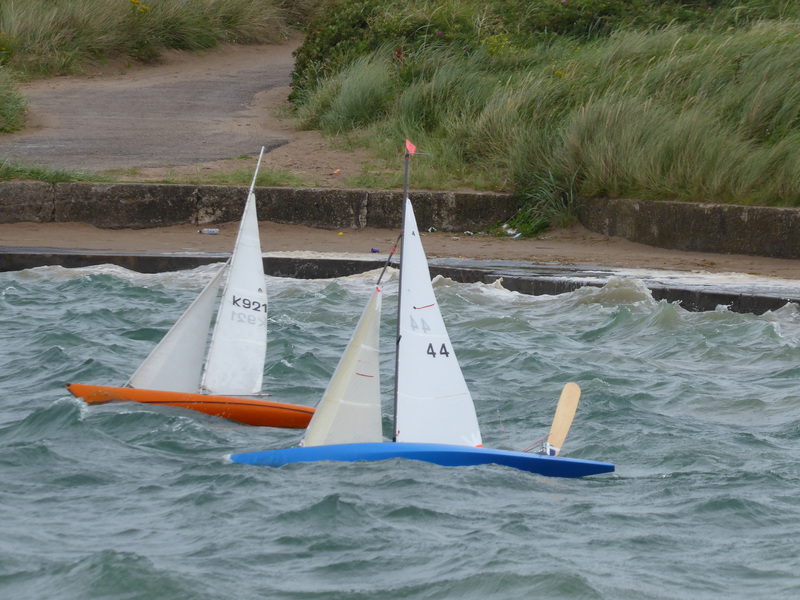 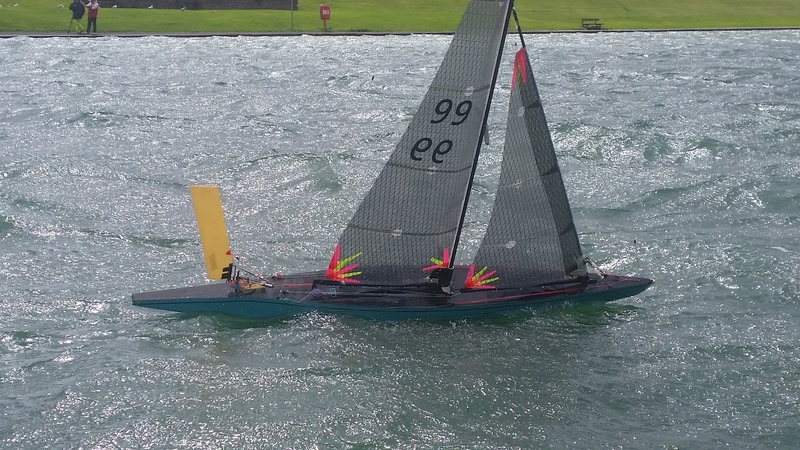 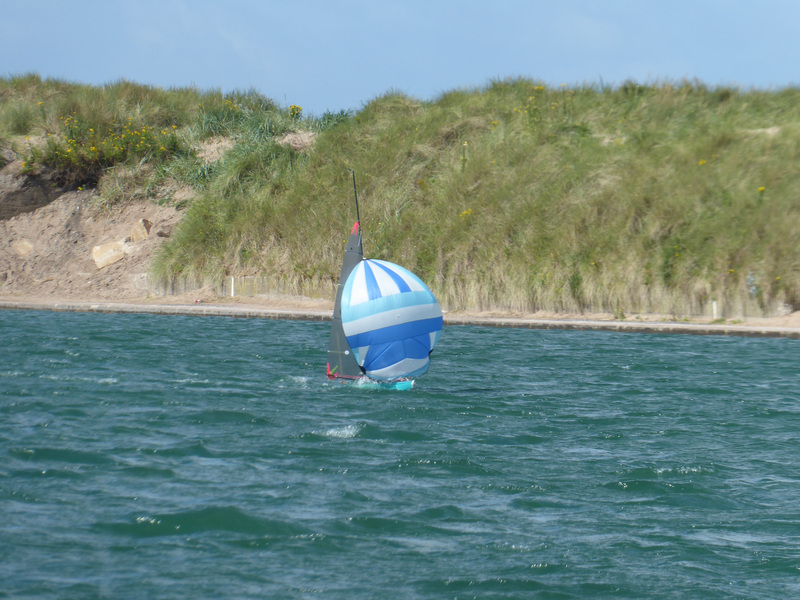 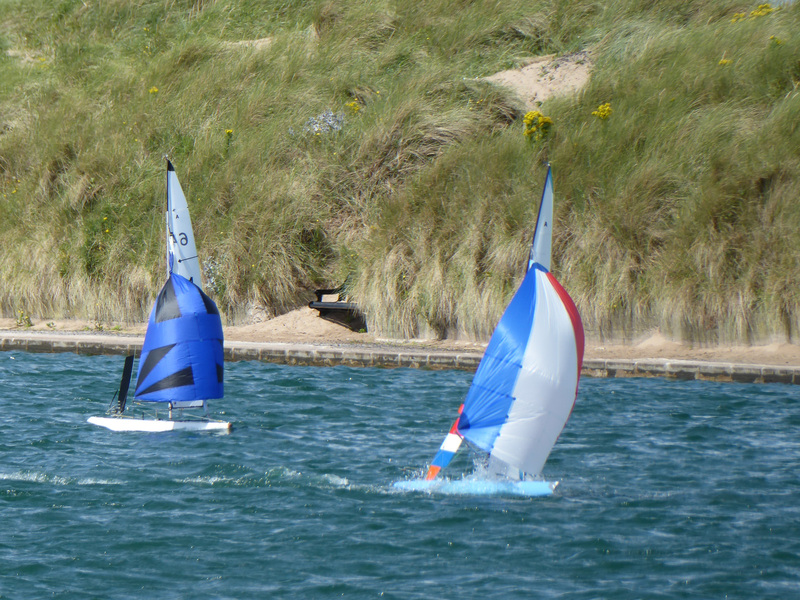 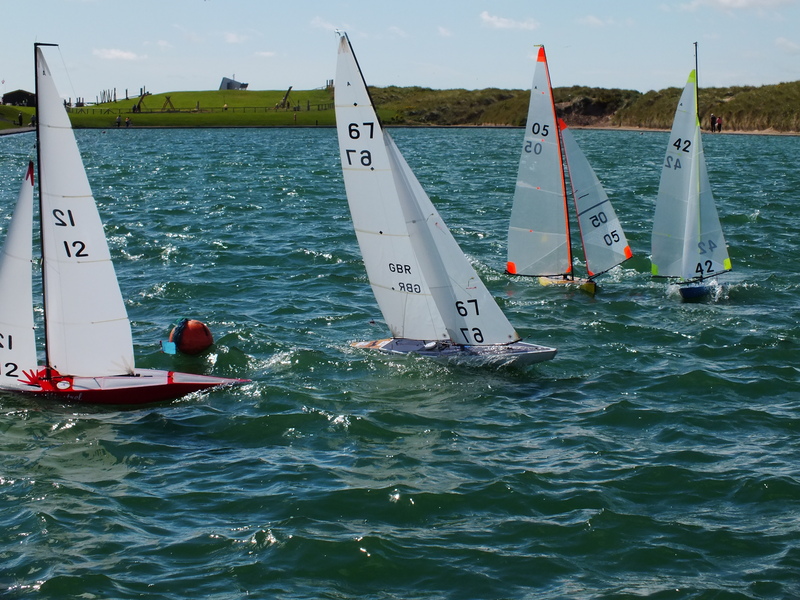 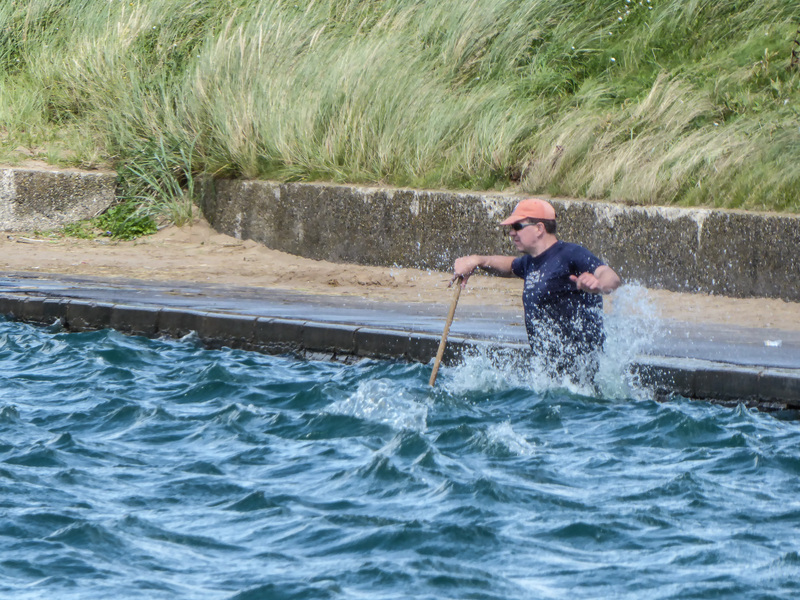 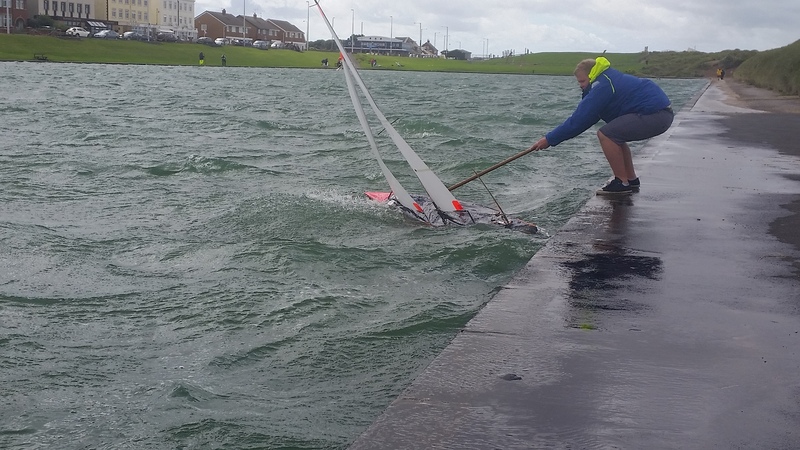 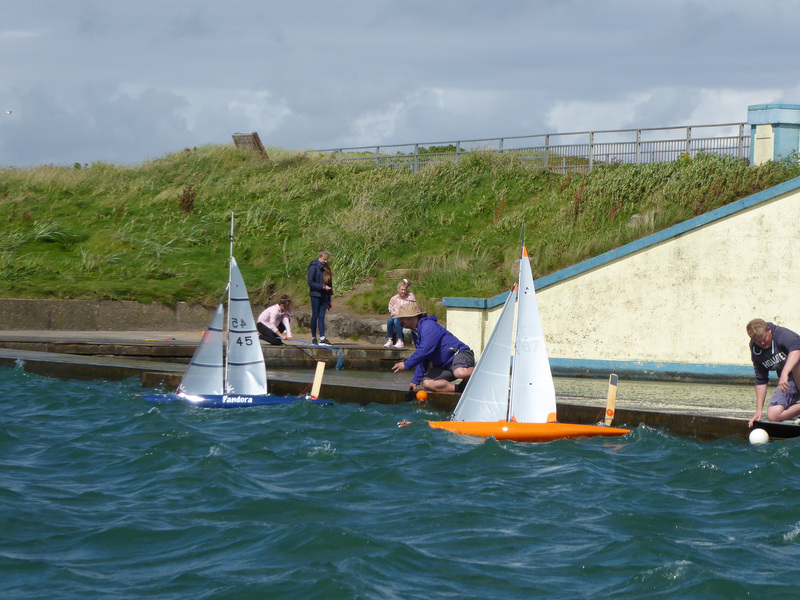 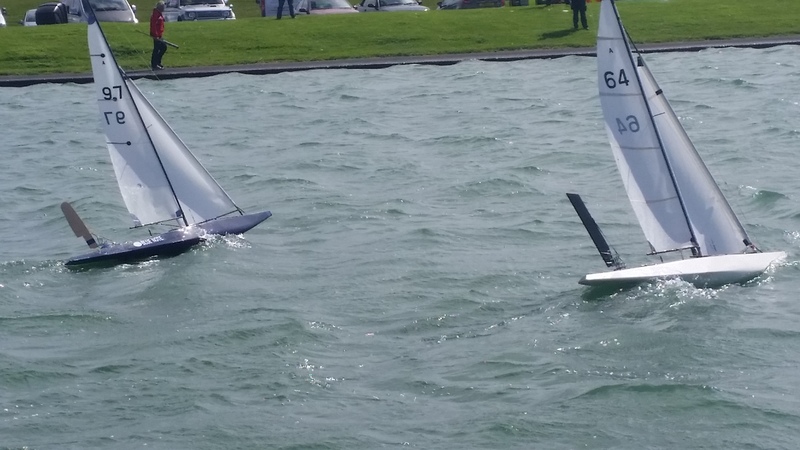 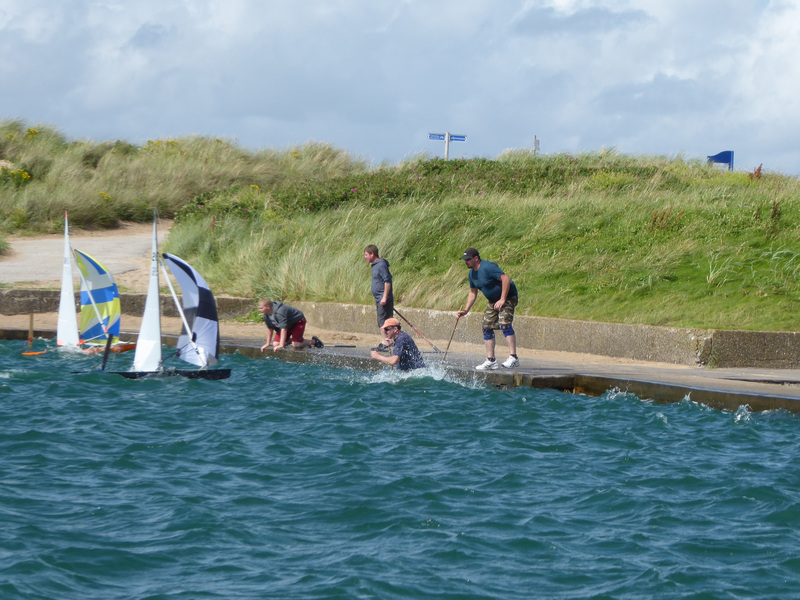 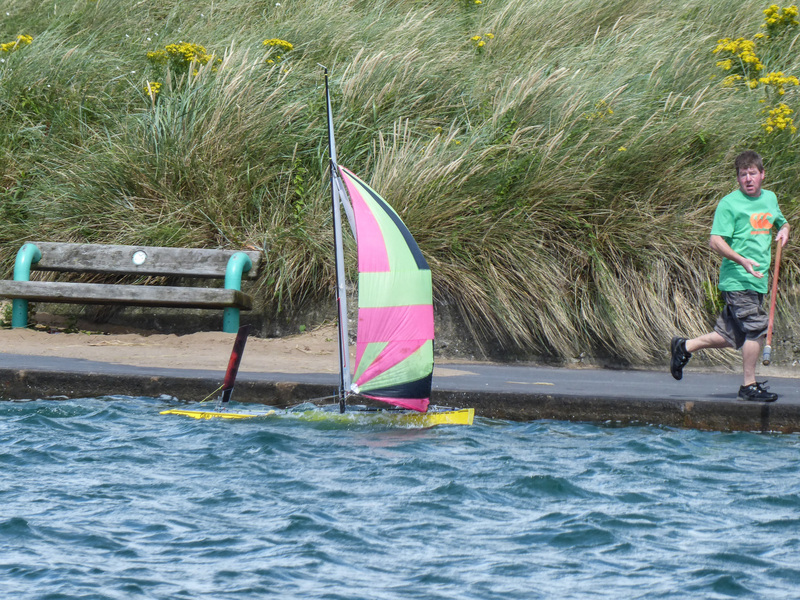 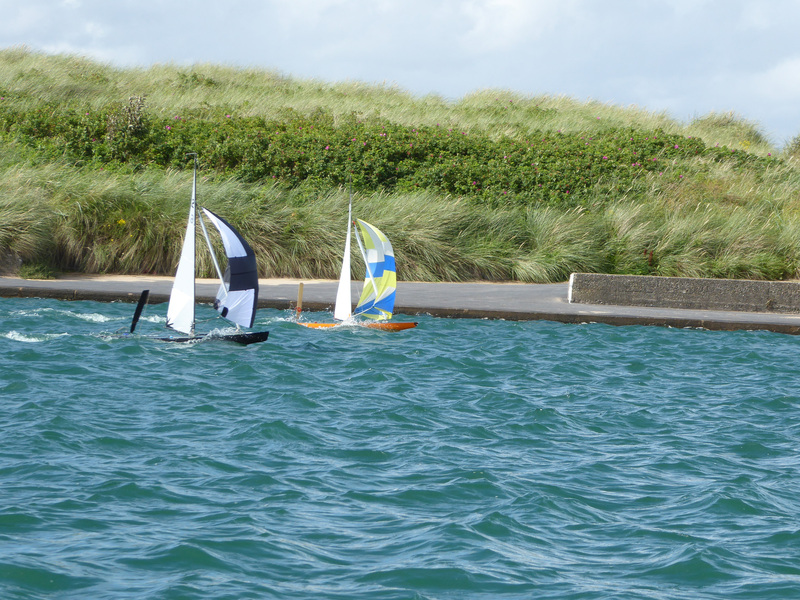 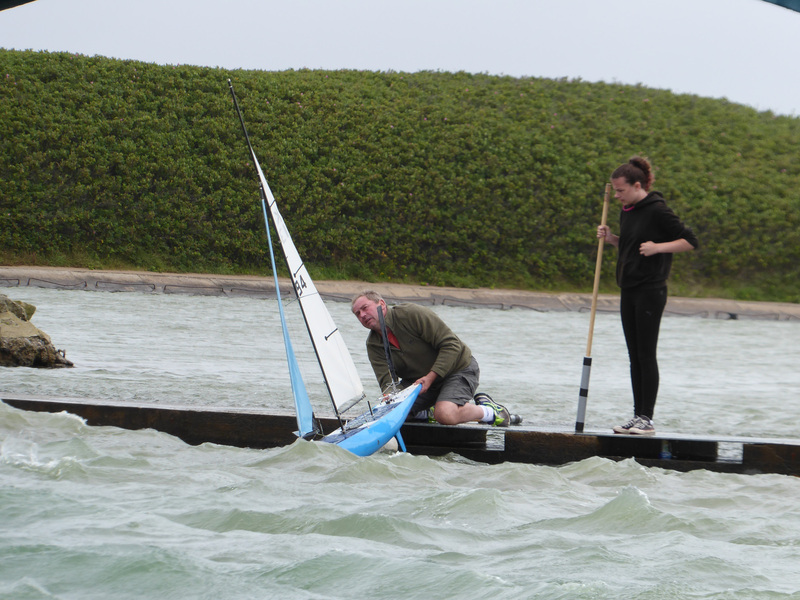 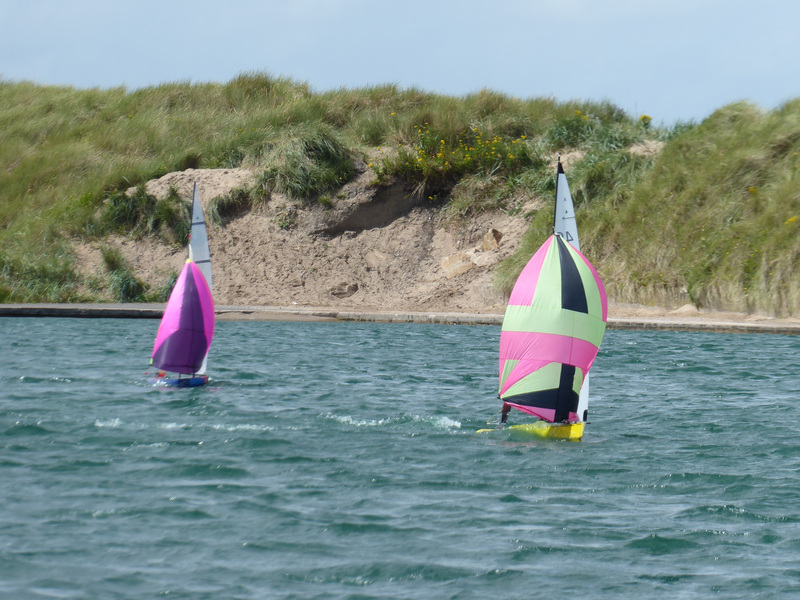 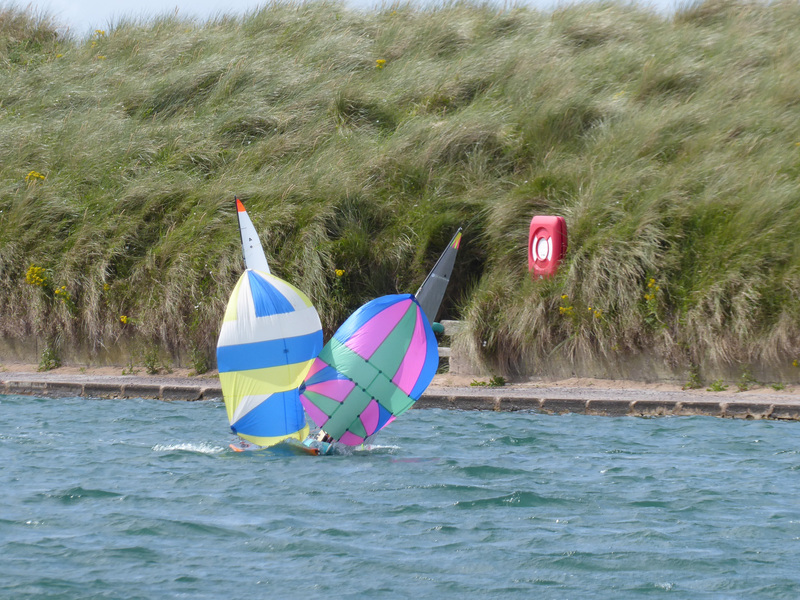 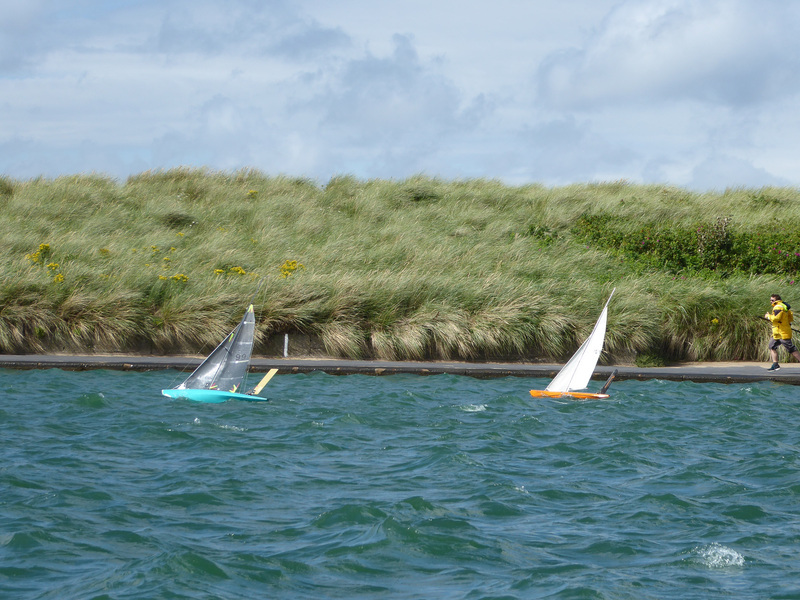 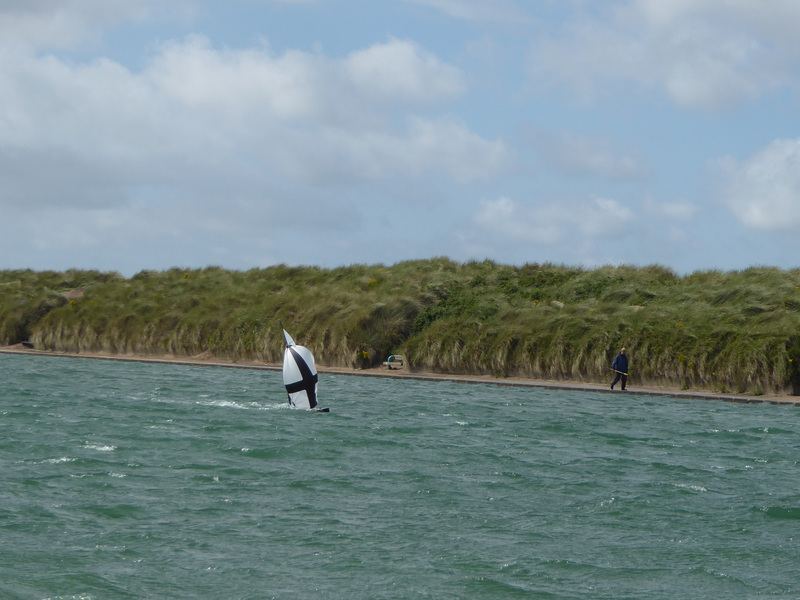 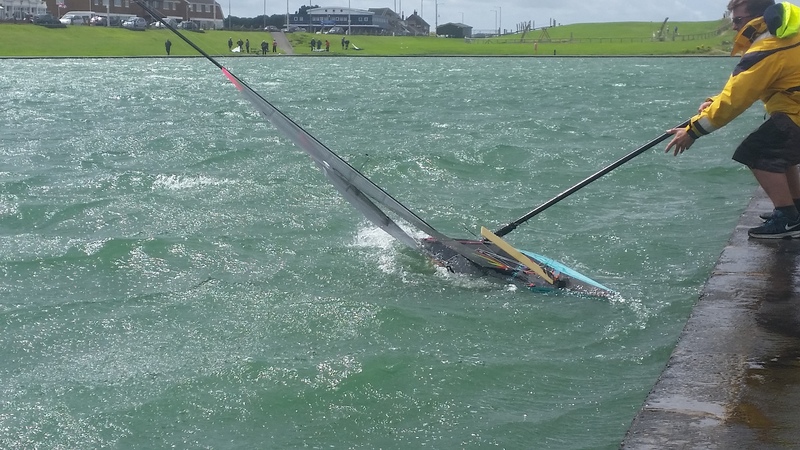 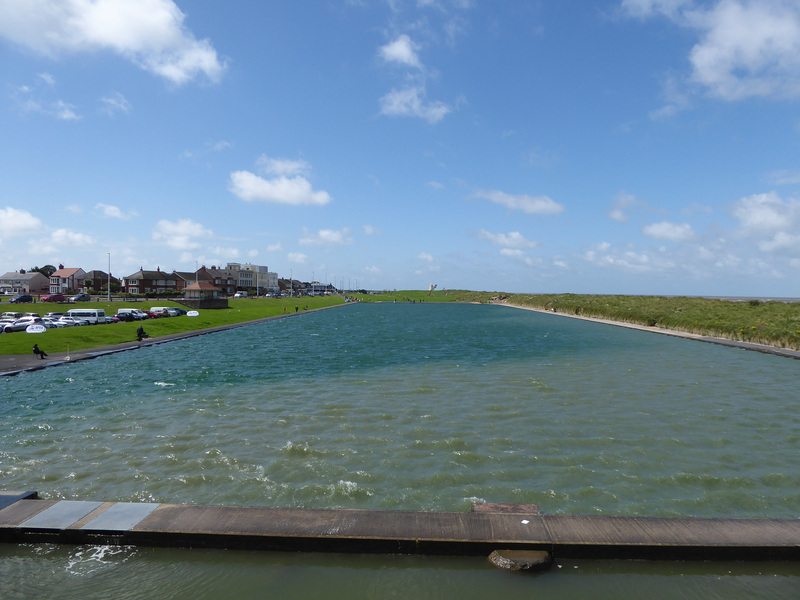 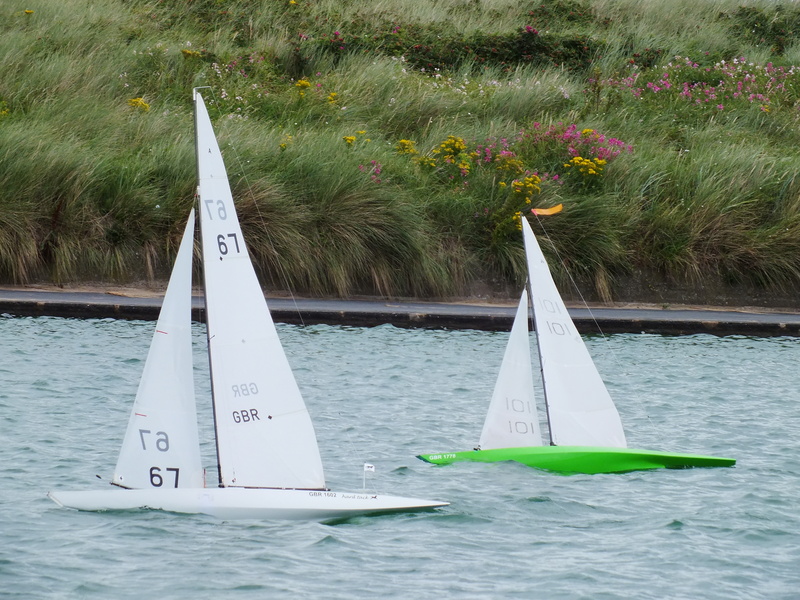 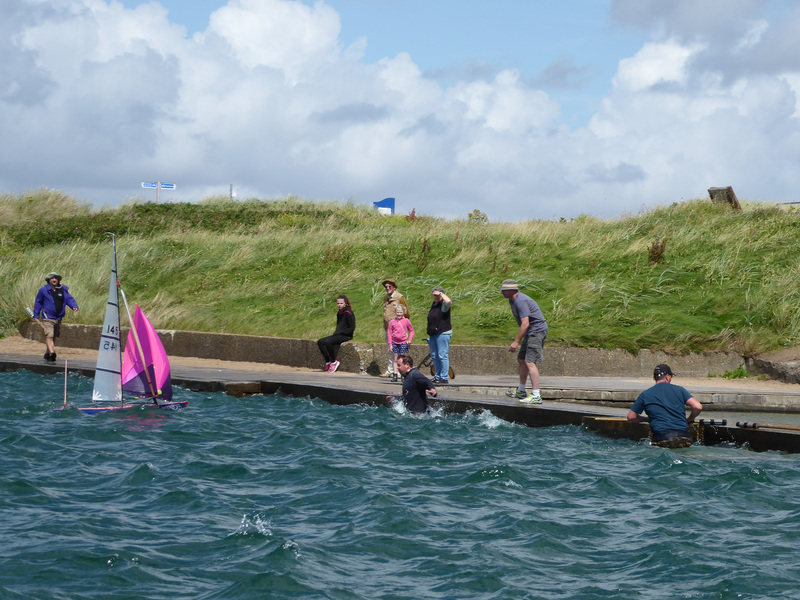 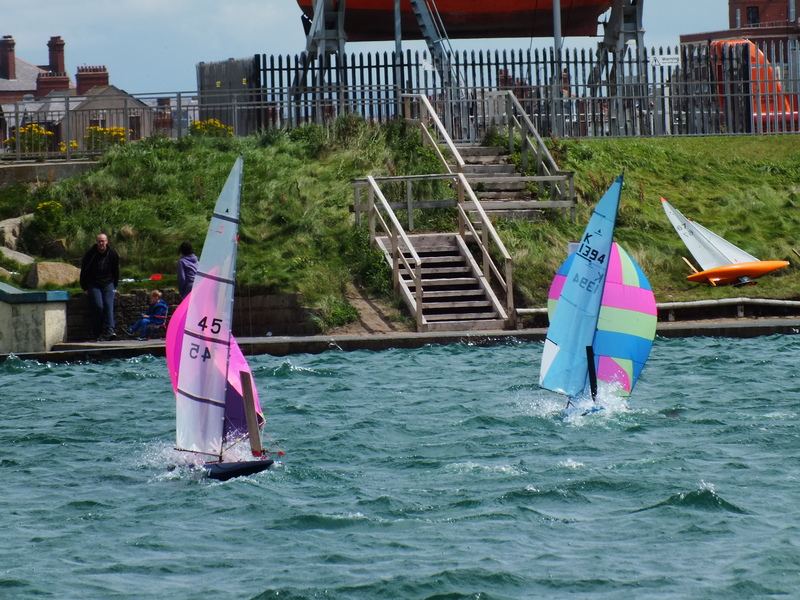 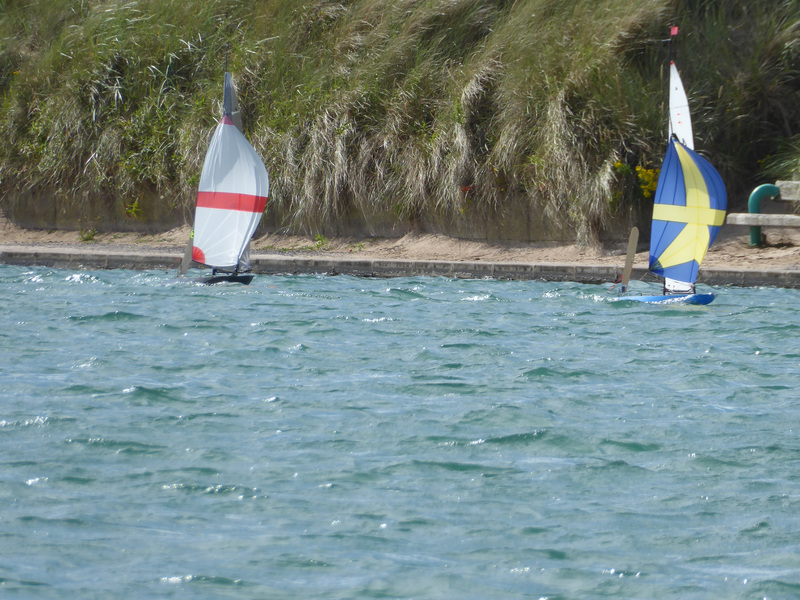 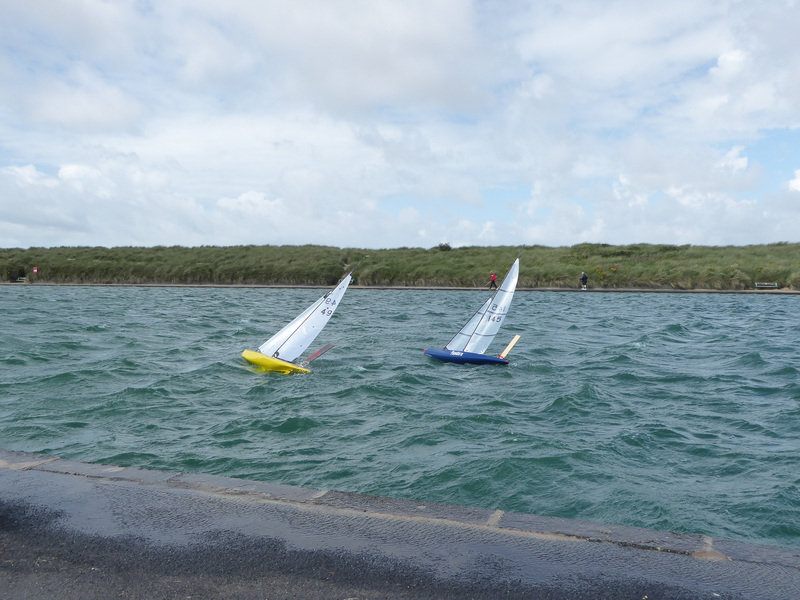 There was plenty of exciting racing in the strong wind conditions. 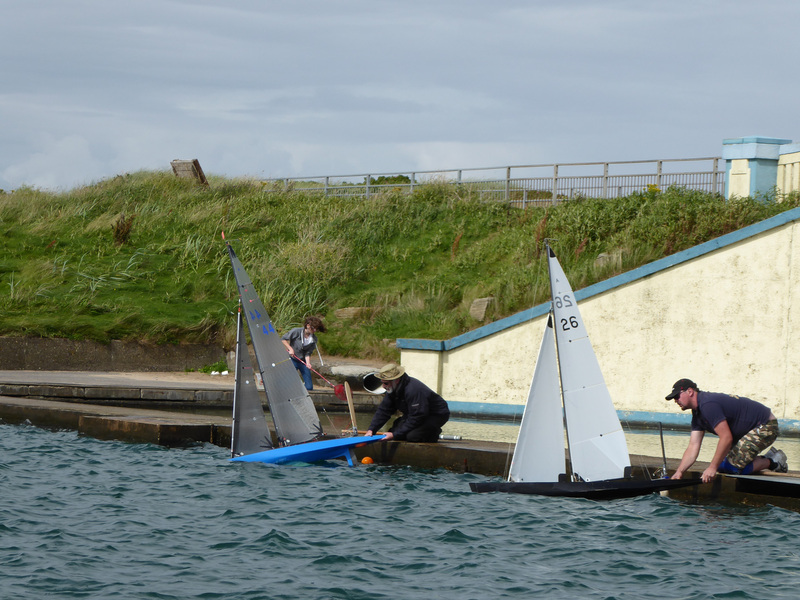 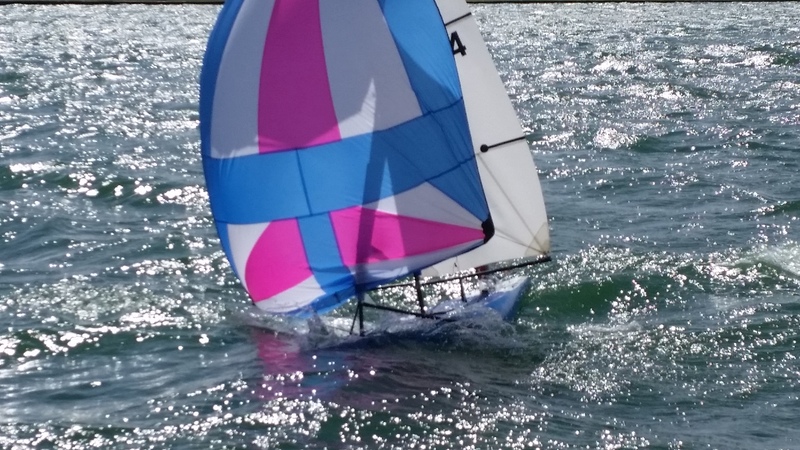 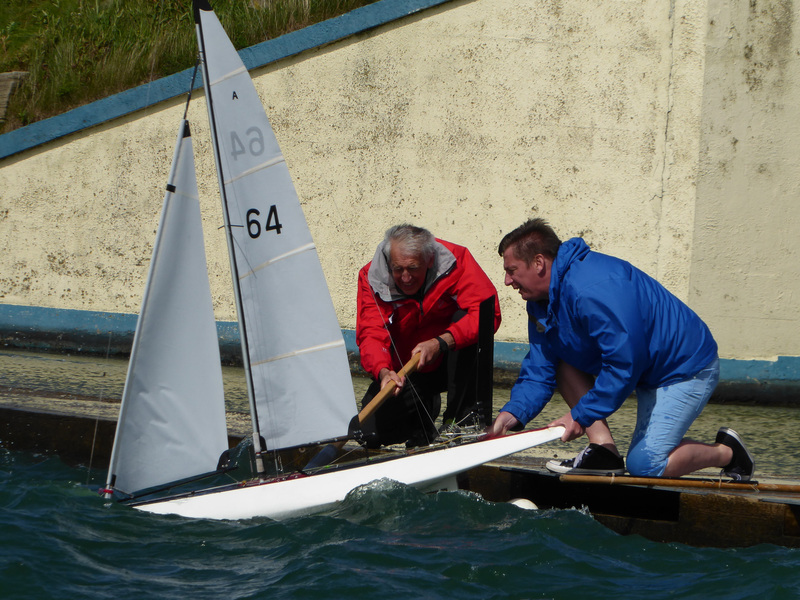 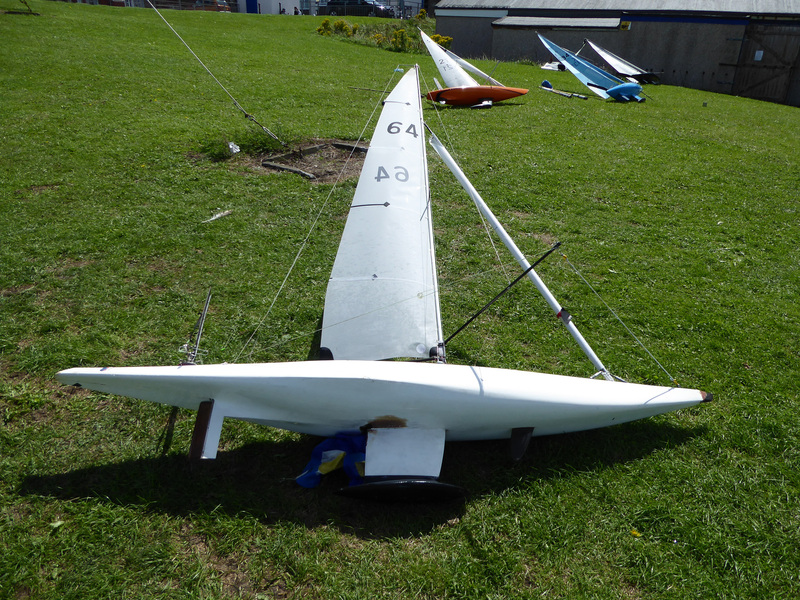 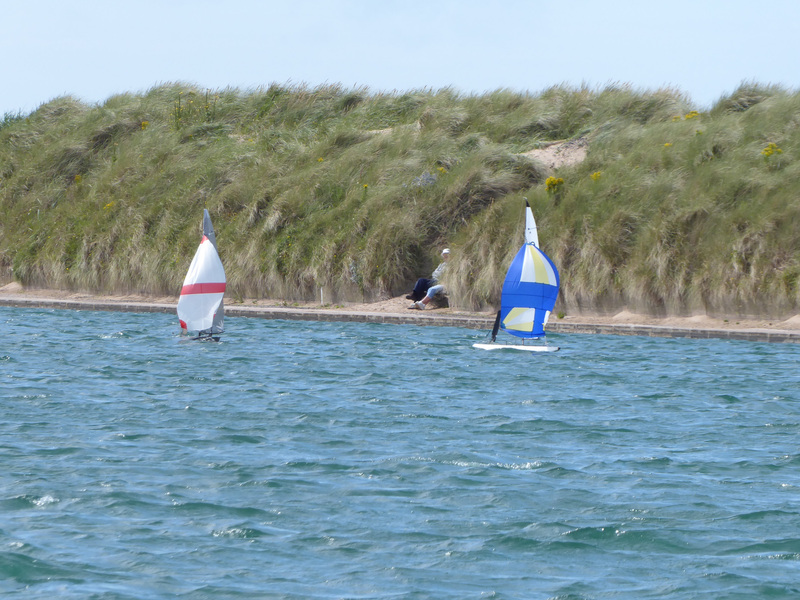 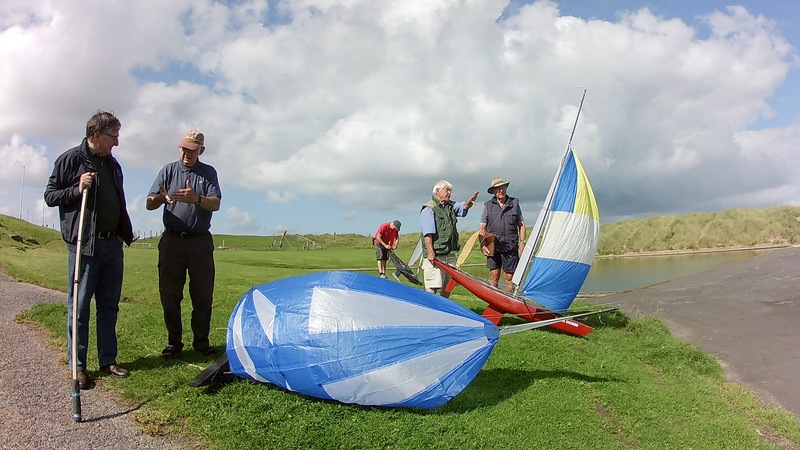 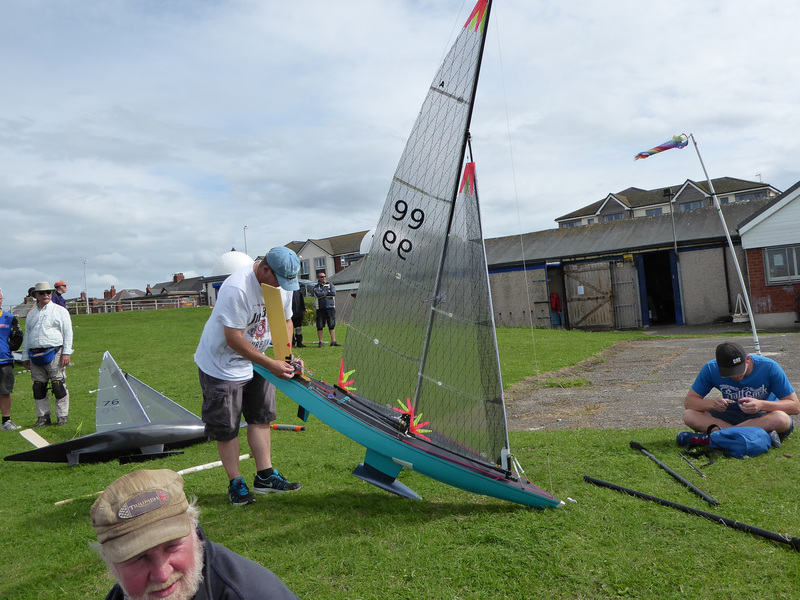 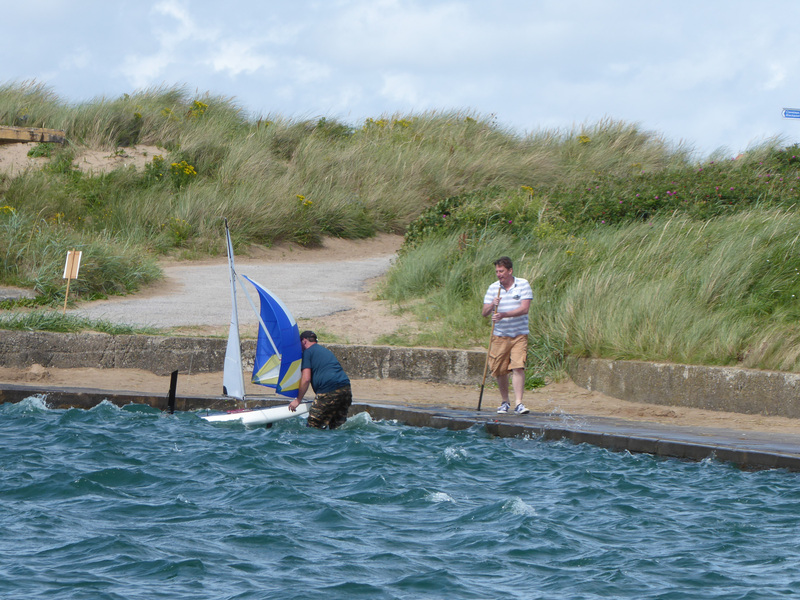 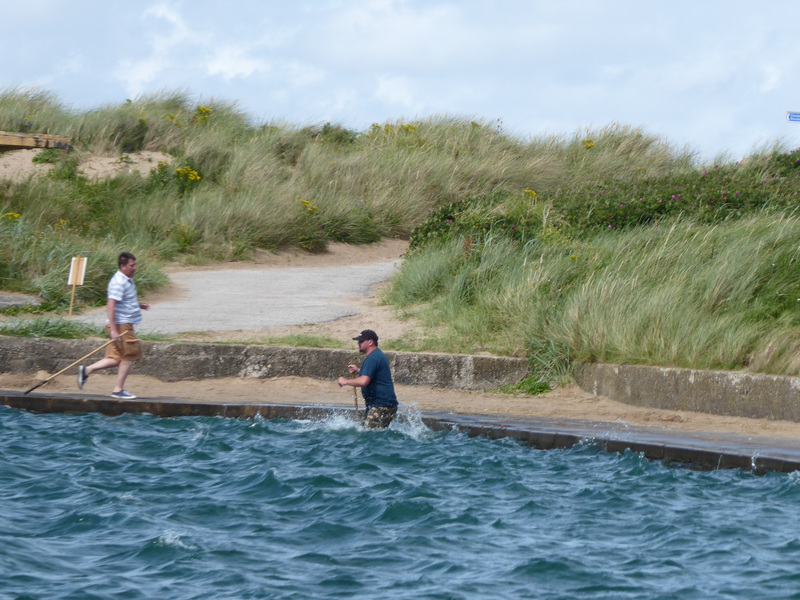 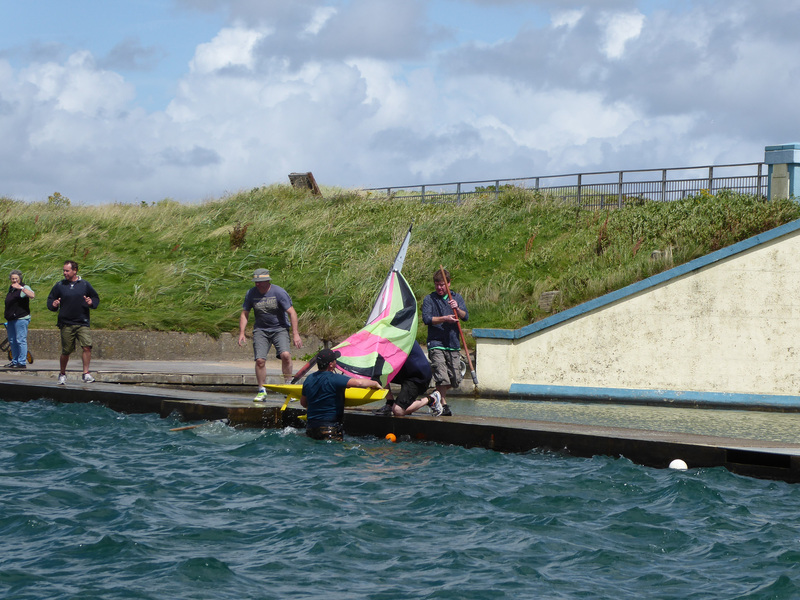 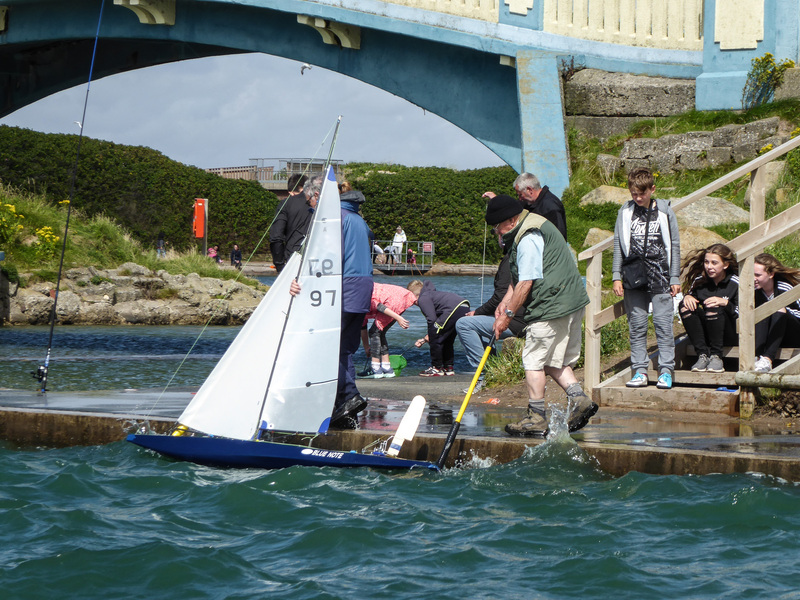 Championship winners were Fleetwood Club members, David & Robert Bell, sailing “Pegasus”. 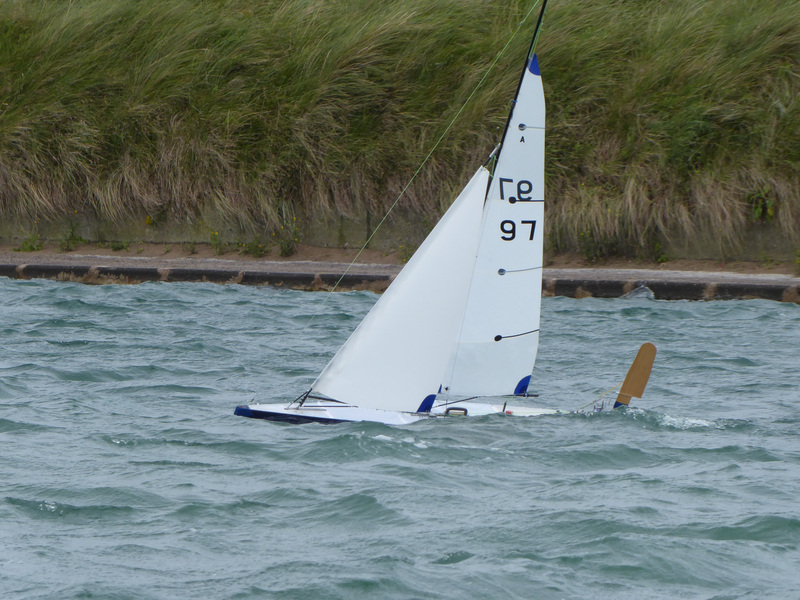 This was David’s third consecutive win of this event for the “Scrutton Cup”. 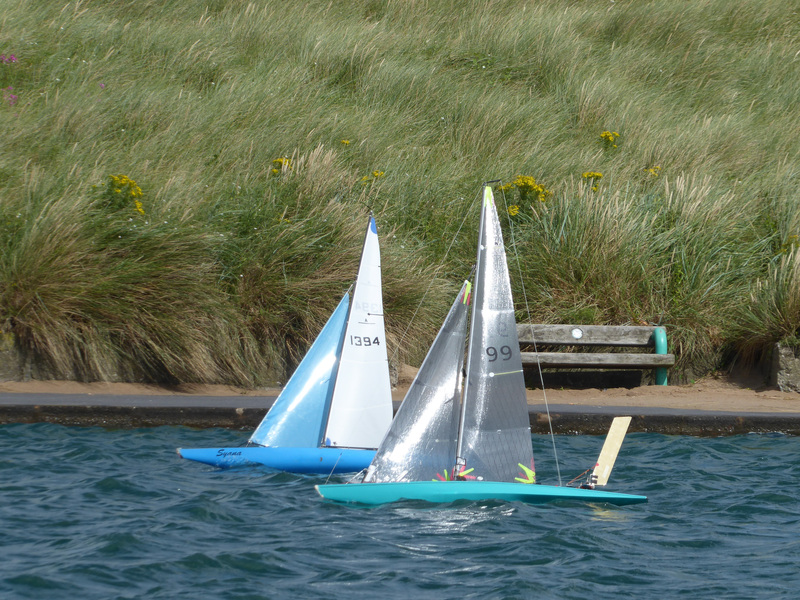 They also won the “Jonnies Cup” for the highest number of wins sailing to windward. 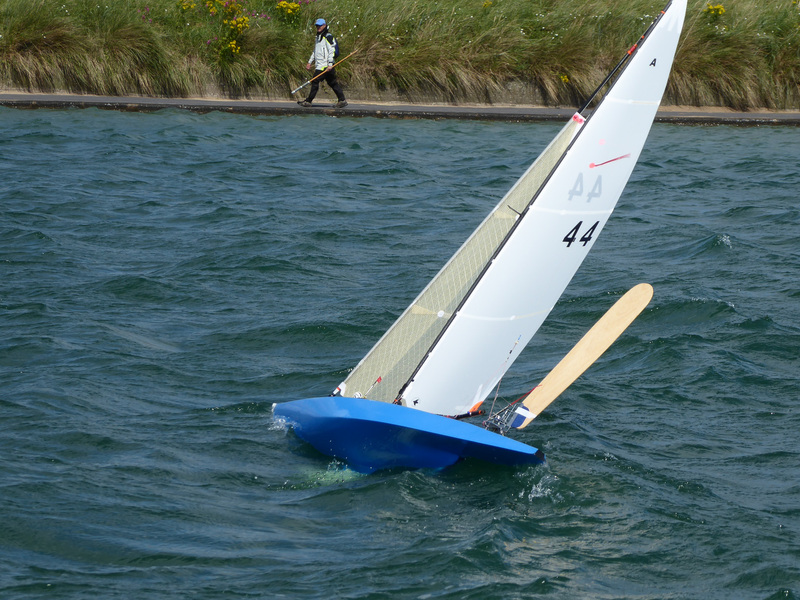 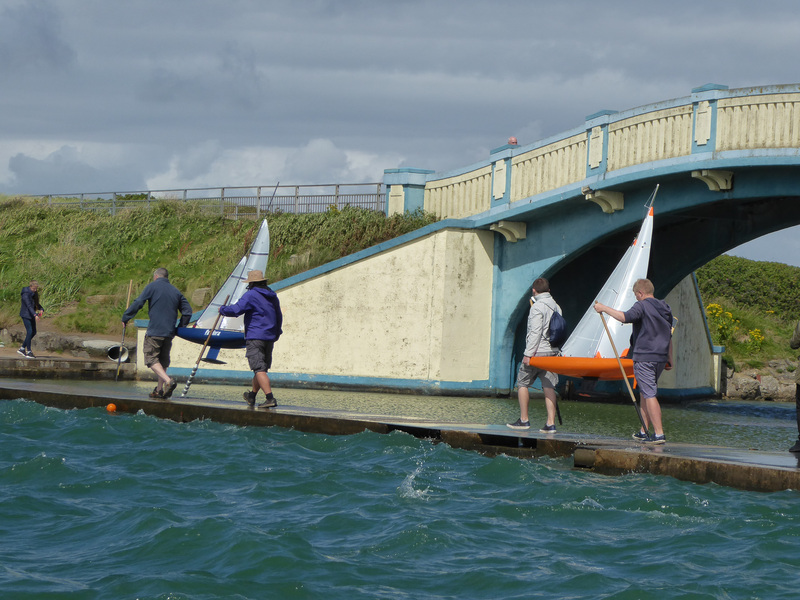 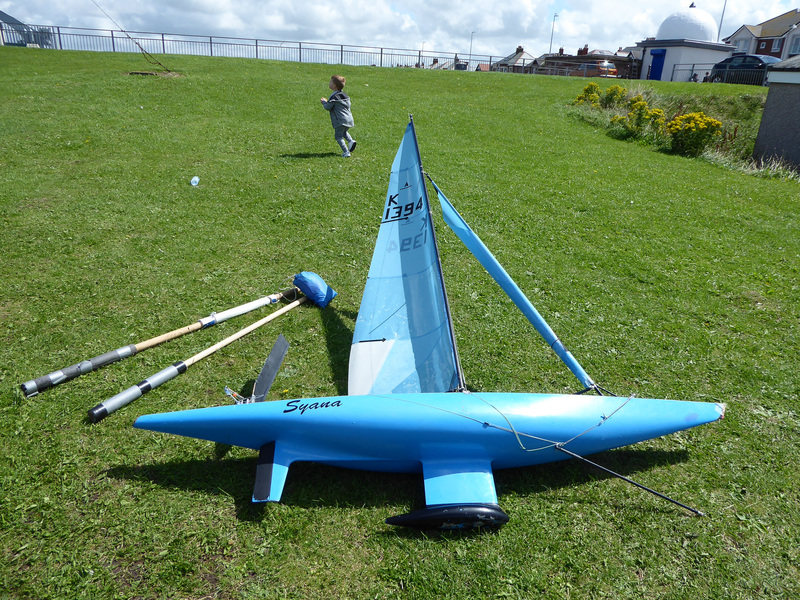 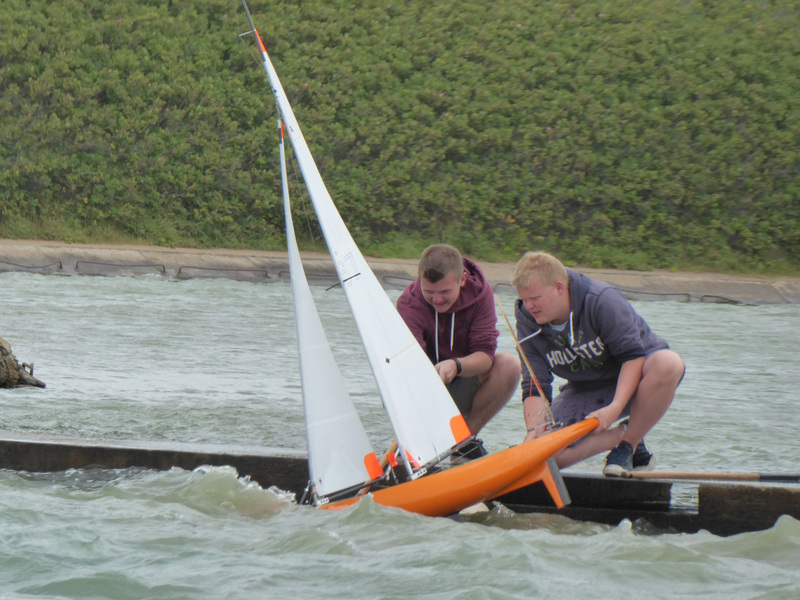 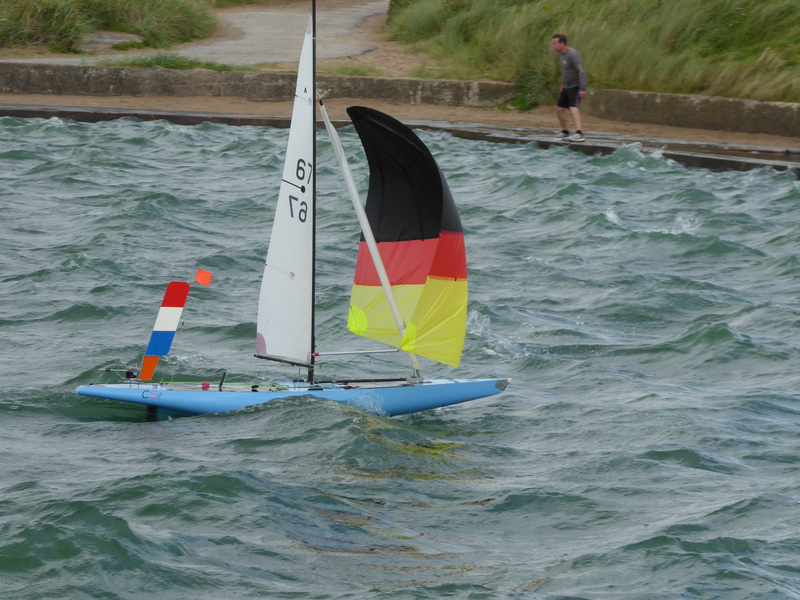 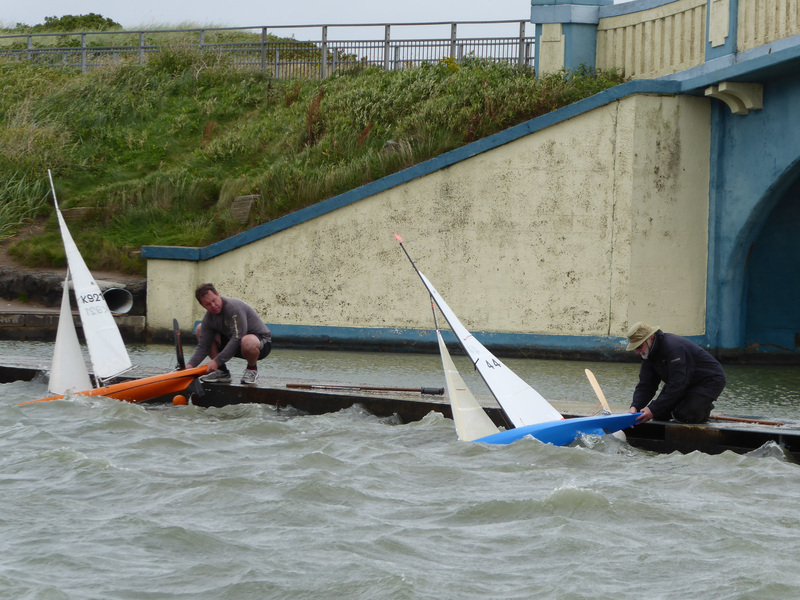 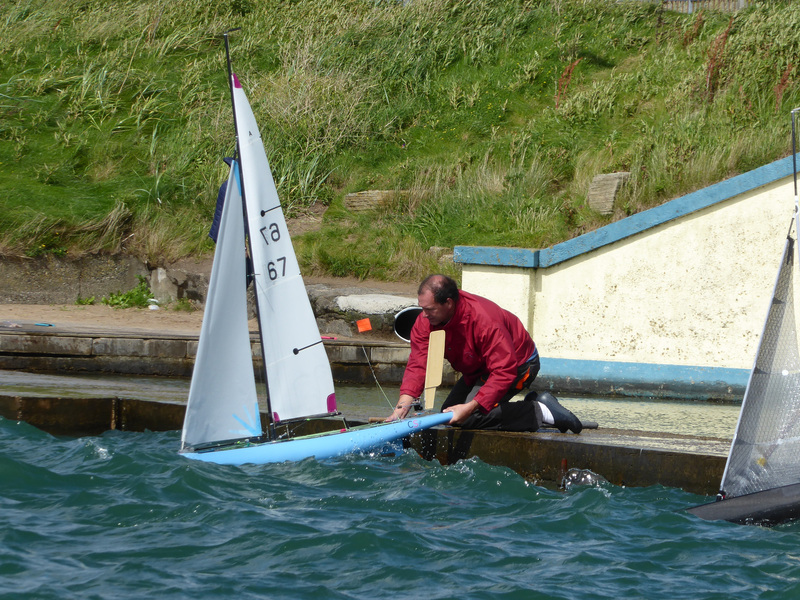 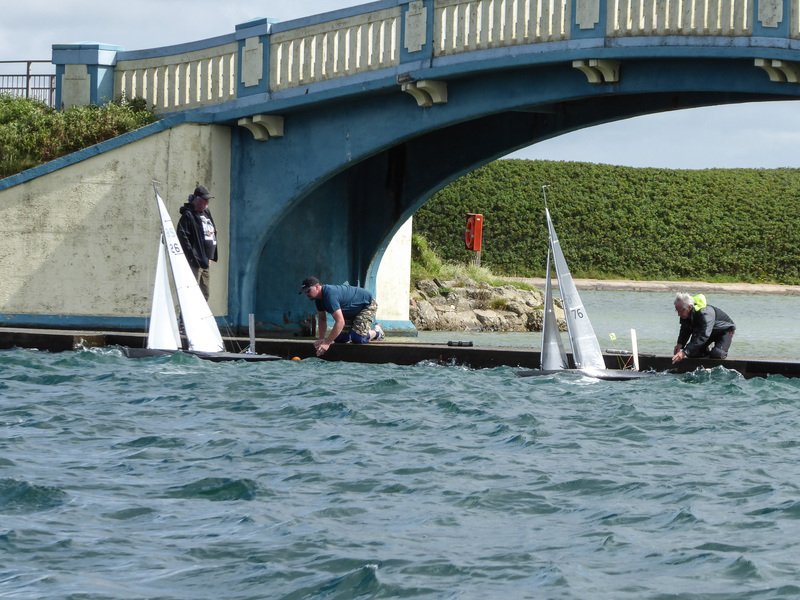 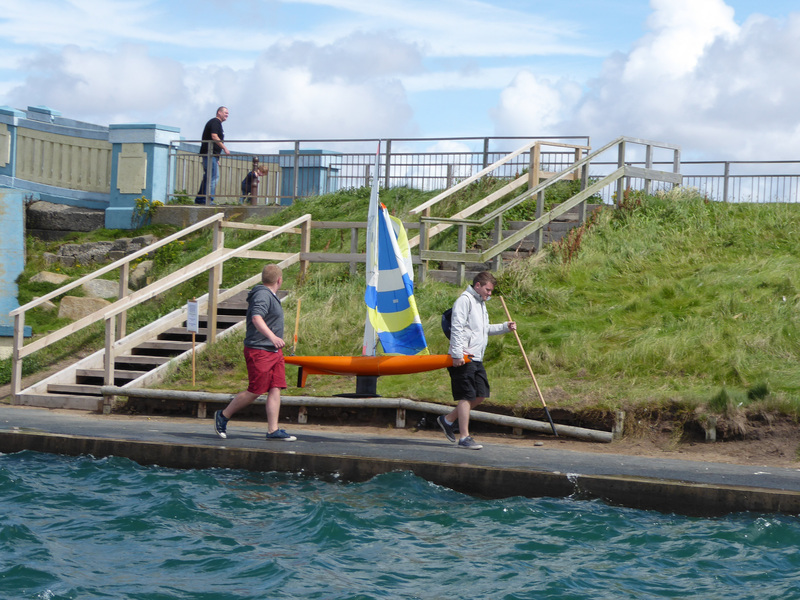 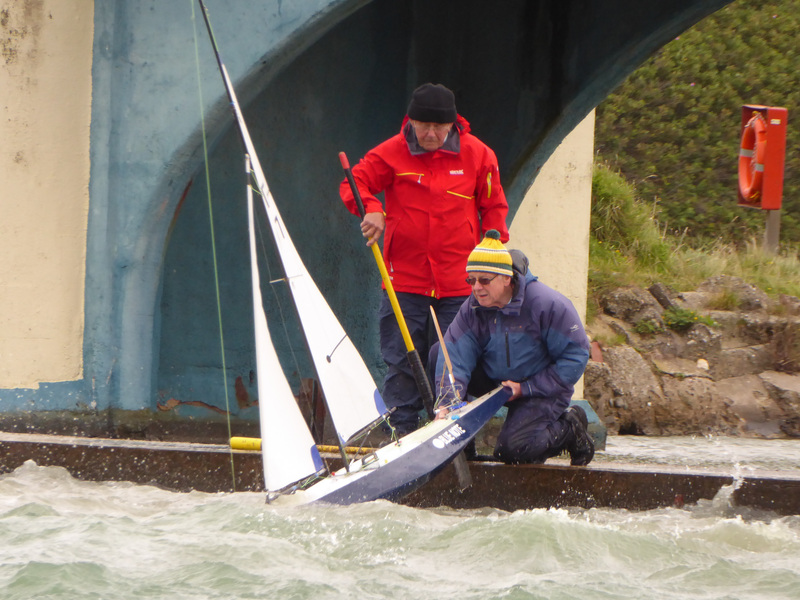 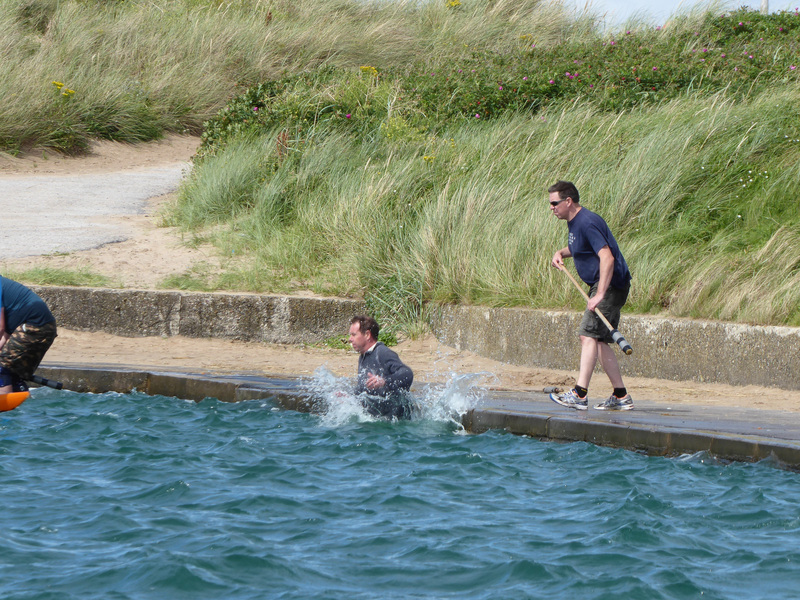 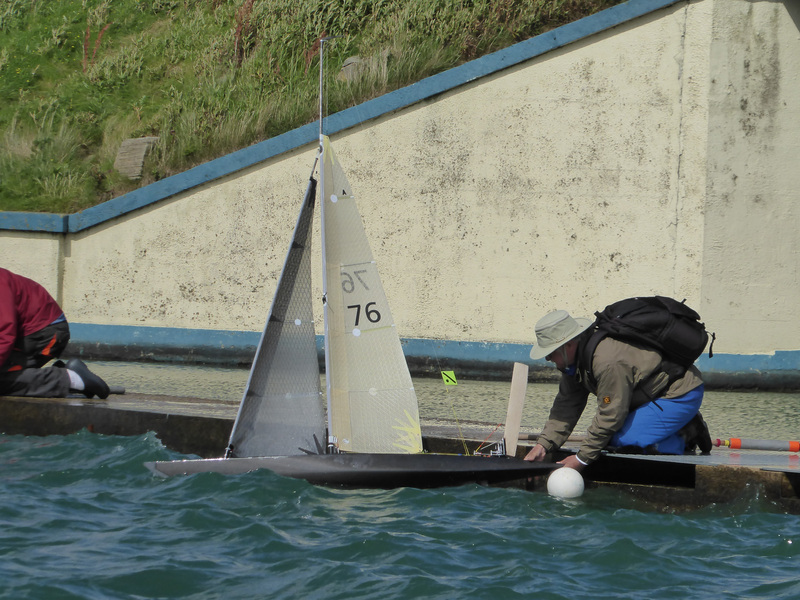 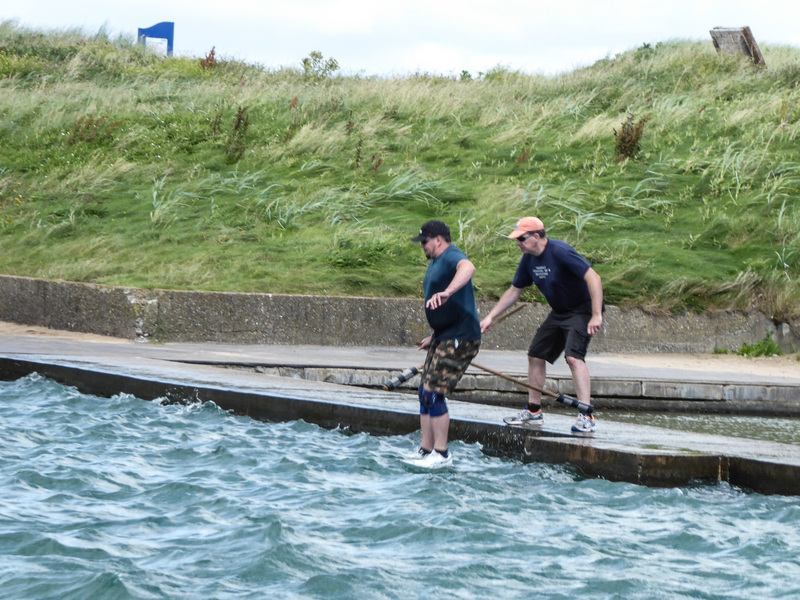 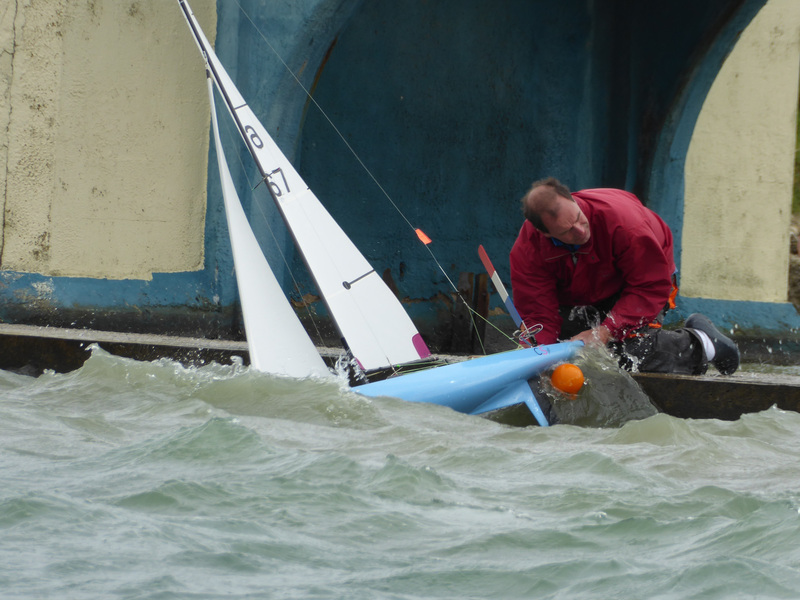 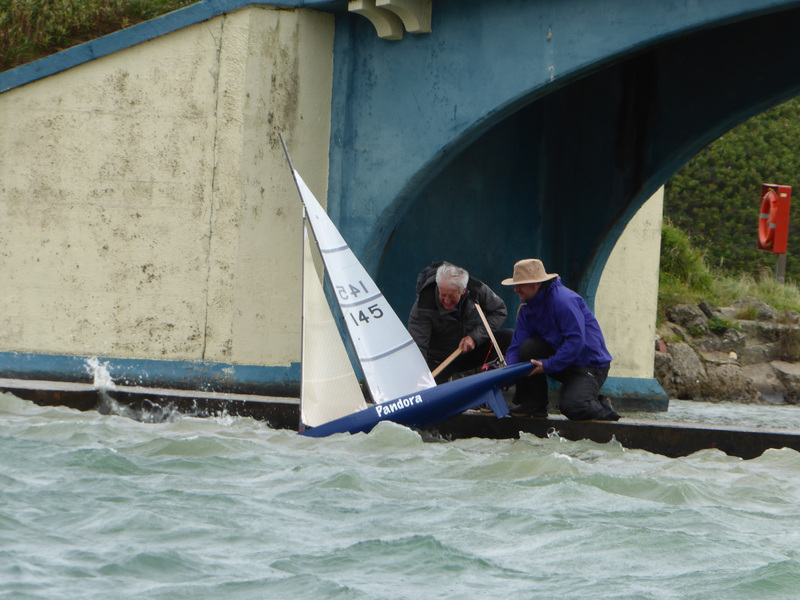 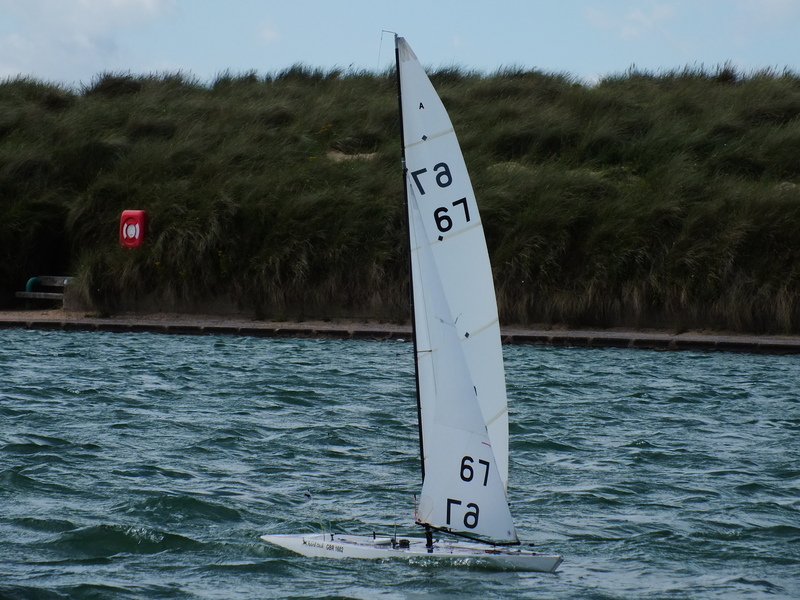 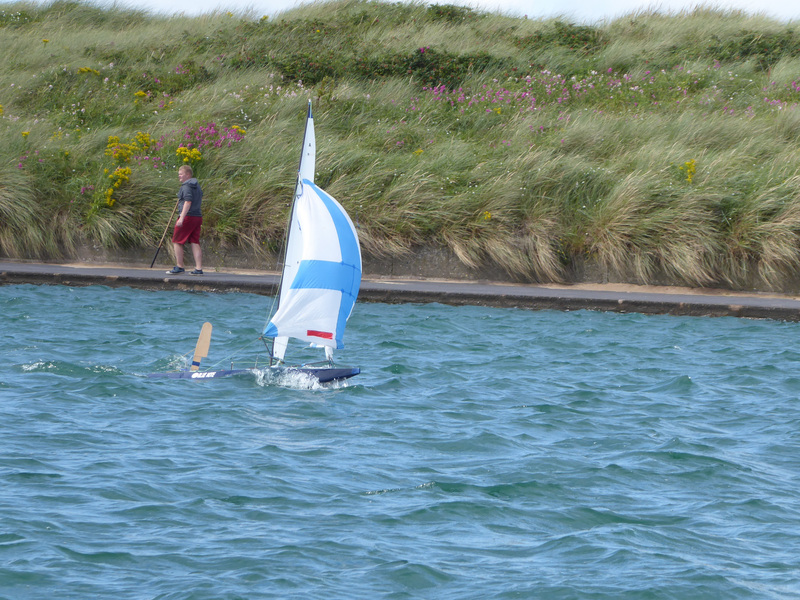 In second place were Fleetwood Club members Peter Whiteside and Eddie Greenwood, sailing “Blue Note”. 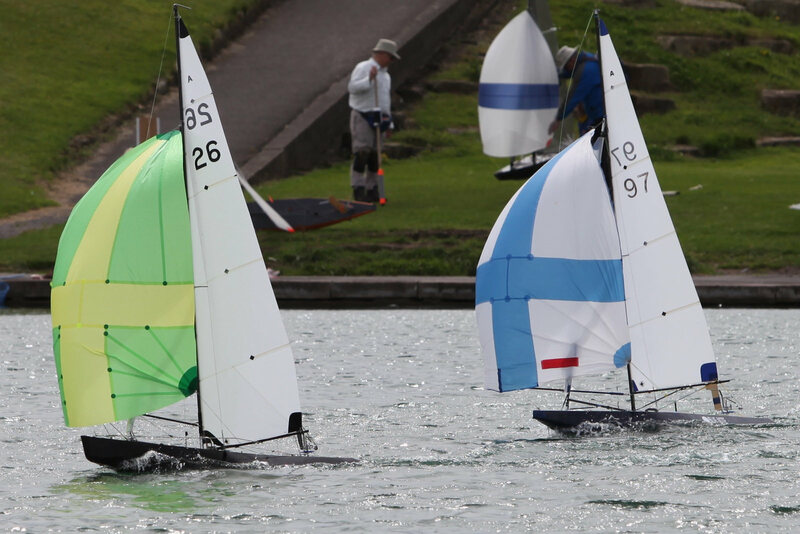 They were awarded the “Little Portugal Cup” for being the highest placed competitors who have not previously won the “Scrutton Cup”. 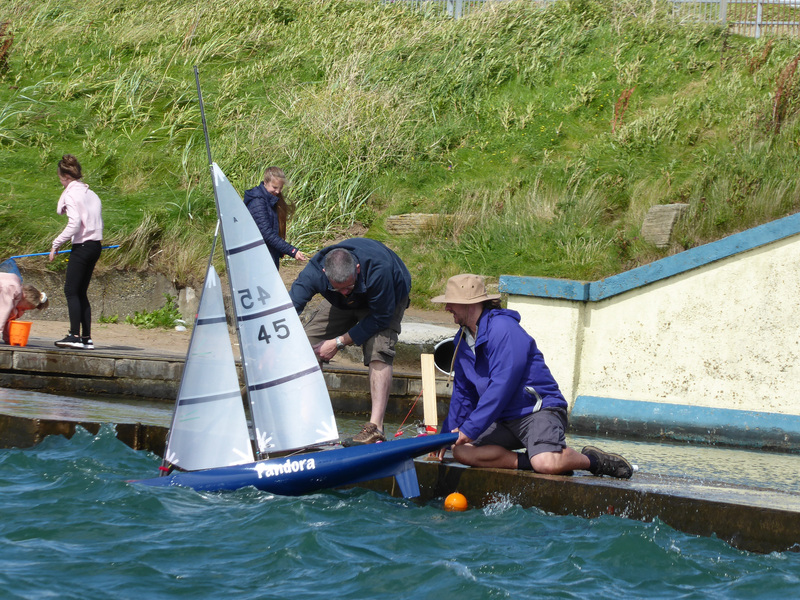 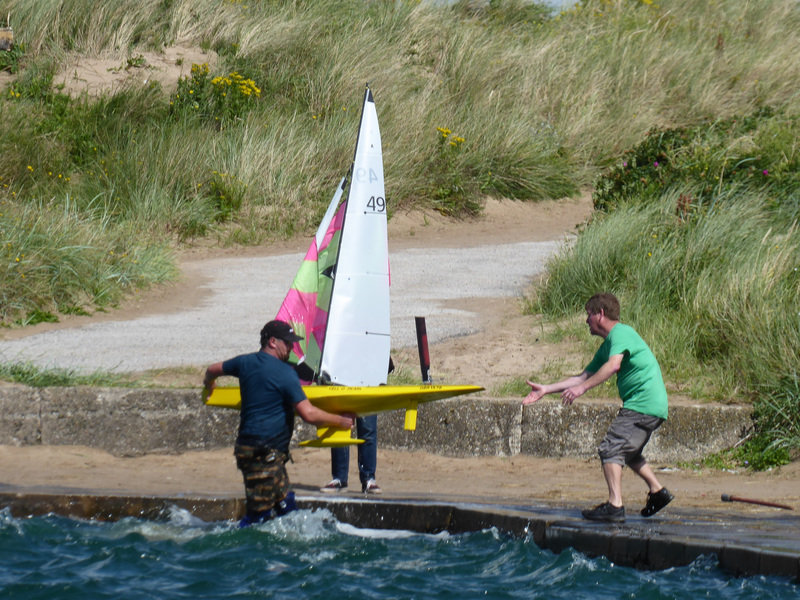 In third place were Martin Roberts and Bernie MacNulty of the Birkenhead Club, sailing “Yellow Peril”. 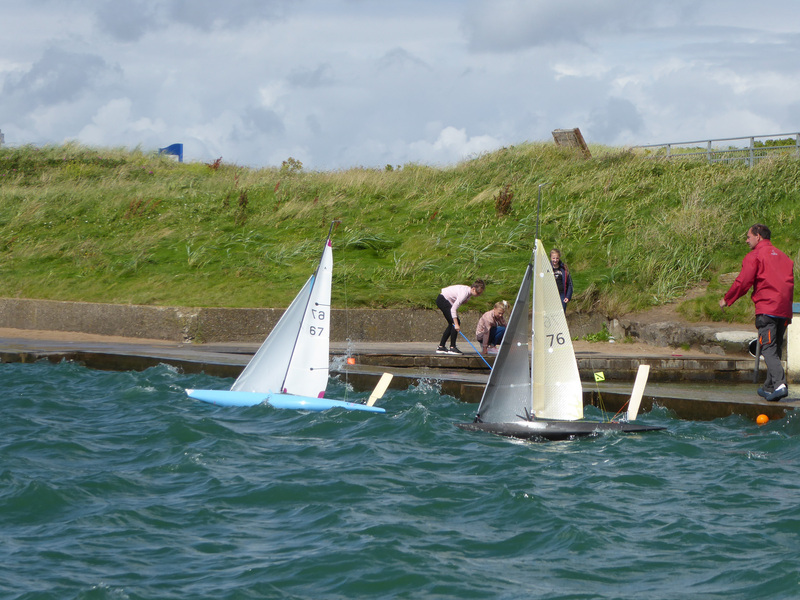 They also won the “Wing & Wing Cup” for the highest number of down-wind races. 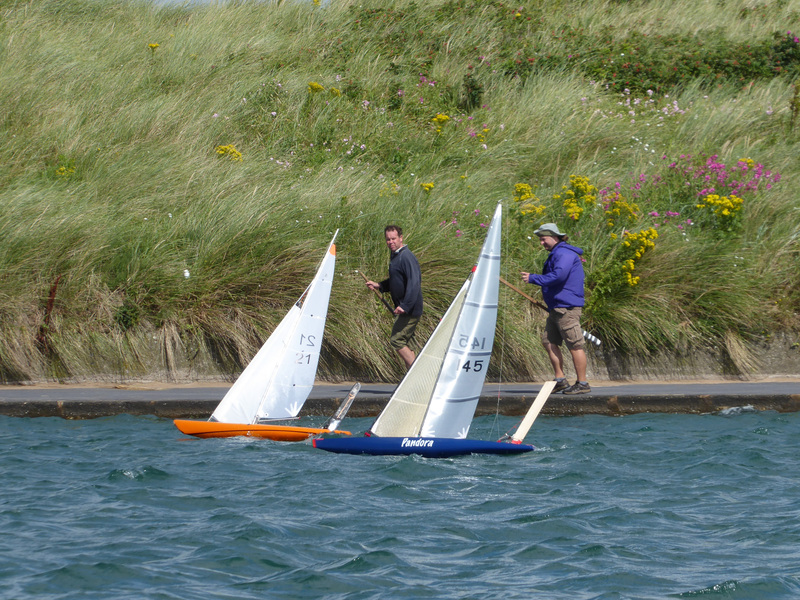 The above three yachts were all designed by Fleetwood Club member, John Simpson. 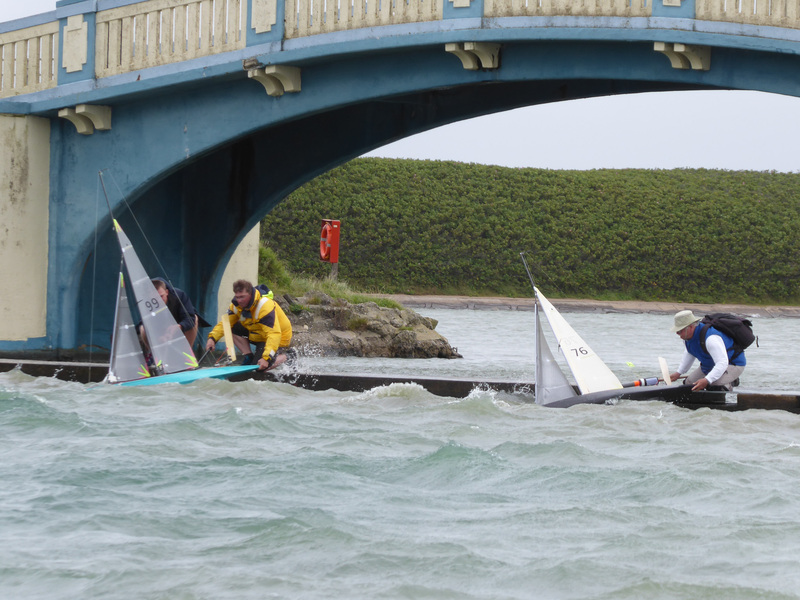 The Fleetwood Club also won the team event for the “Neptune Trophy”, the team of three yachts consisting of “Pegasus”, “Blue Note” and “Dilligaff”, the latter yacht sailed by Robert and Tomas Walsh. 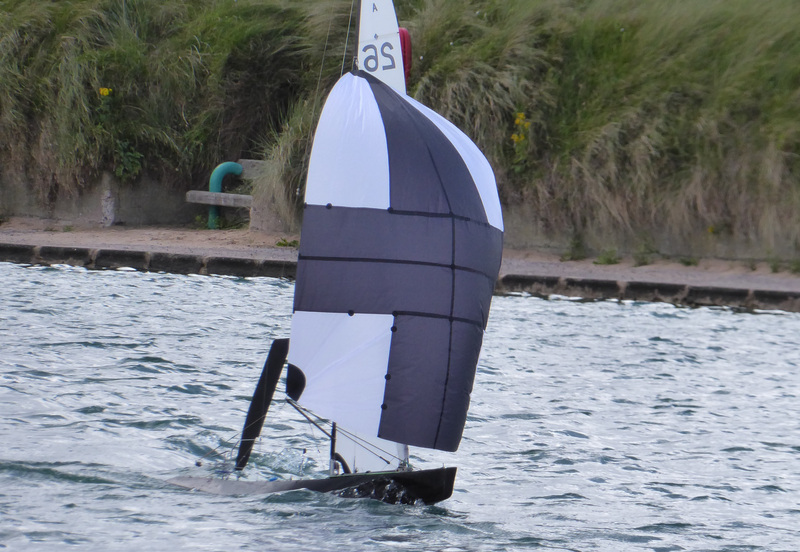 The Denis Lippett Trophy, for the most improved junior competitor, was awarded to Amber Geldard, sailing “Syana” with her father, David, representing the Leeds & Bradford Club. 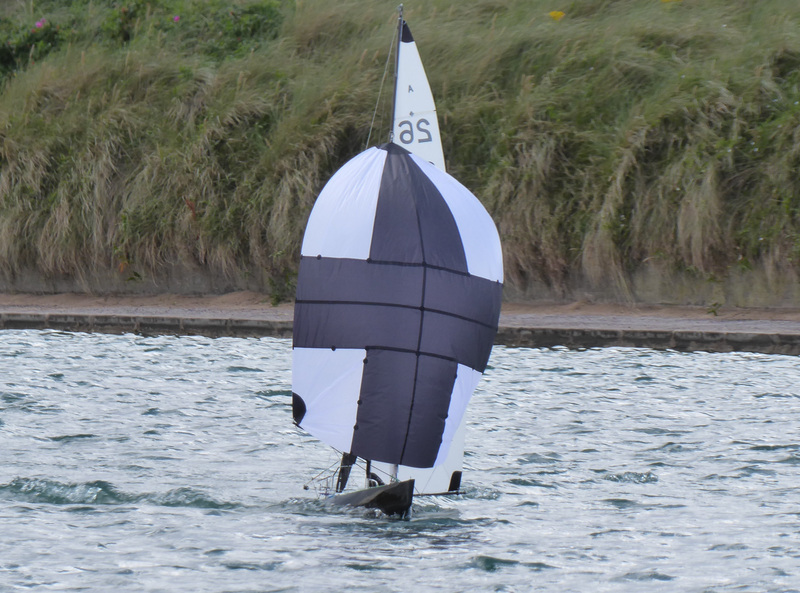 The mid-week Knock-Out competition for the magnificent 90 year old “Yachting Monthly Cup” was won by the Wyeth family, consisting of grandfather Graham, son Shaun and grandson Louis, sailing “Carbon Copy”. 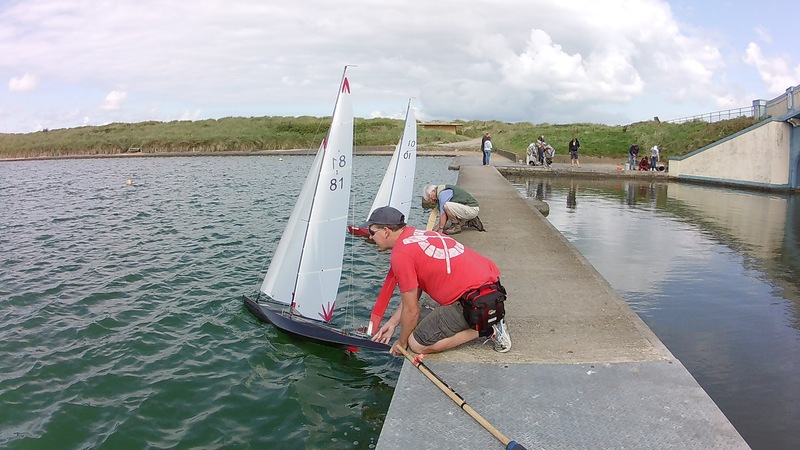 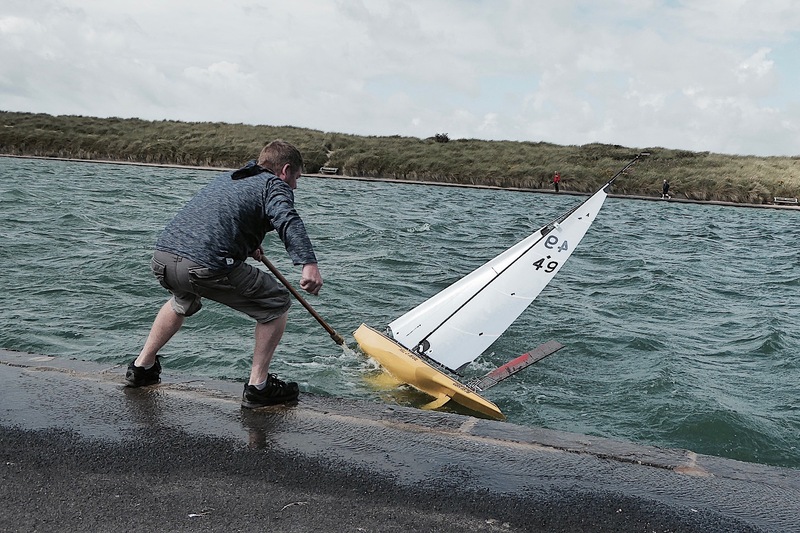 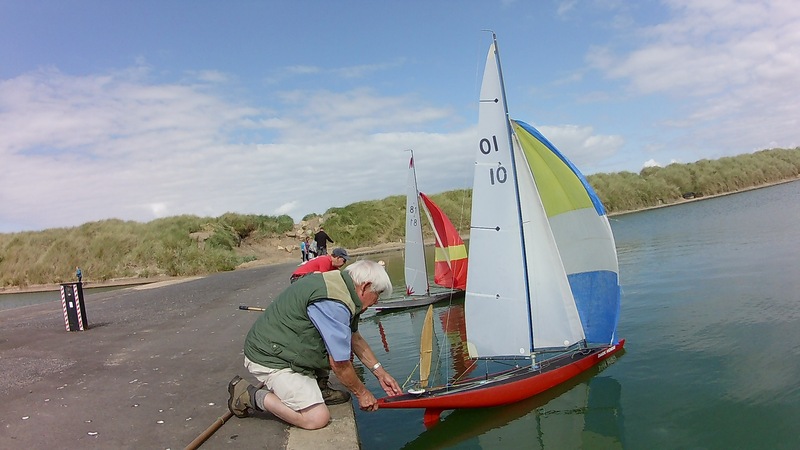 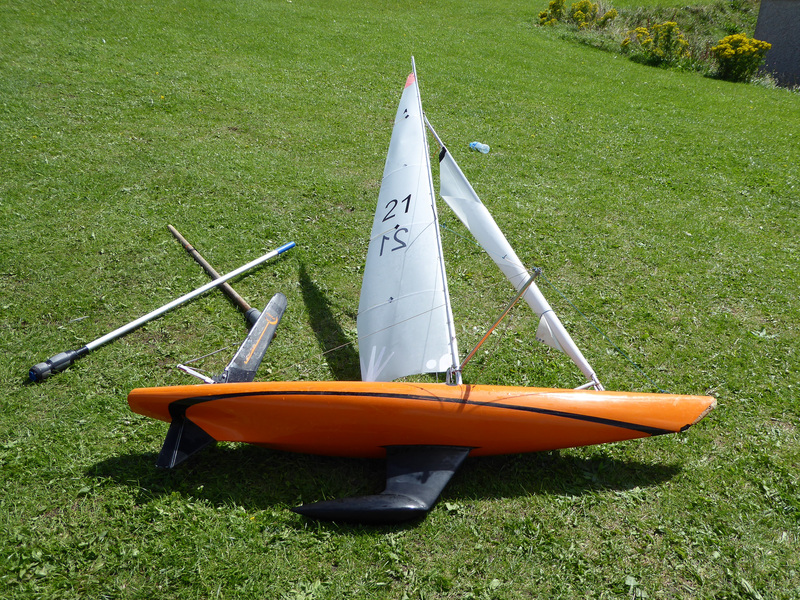 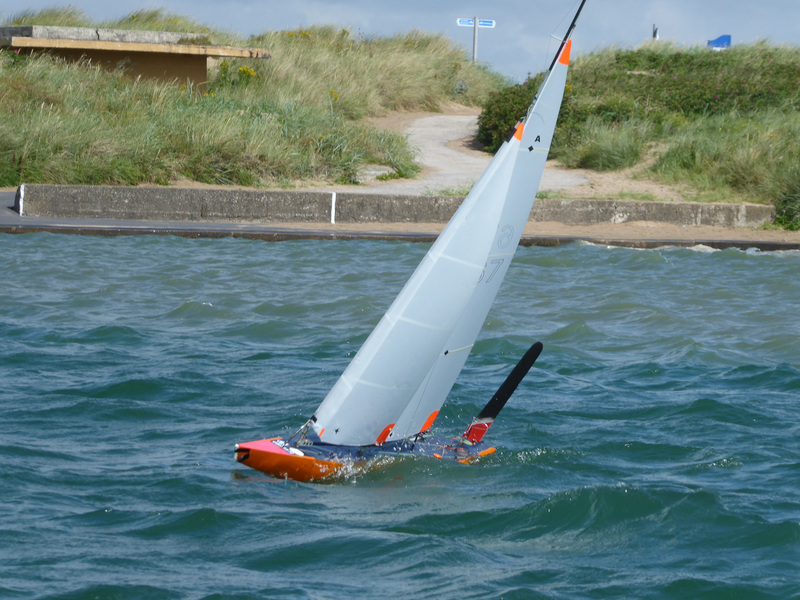 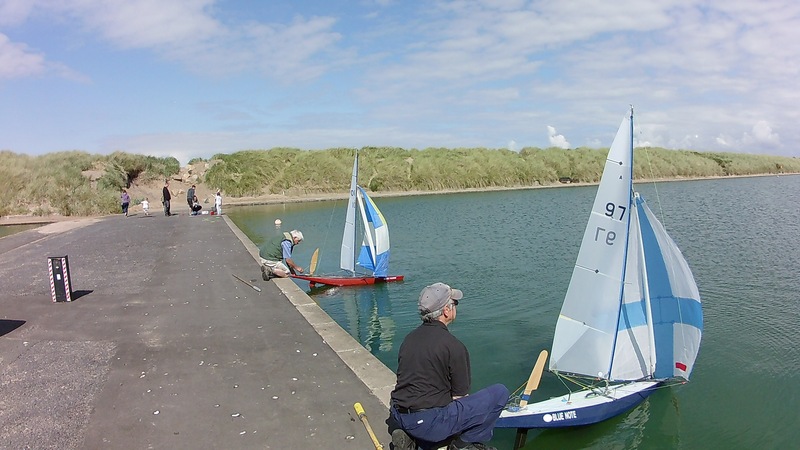 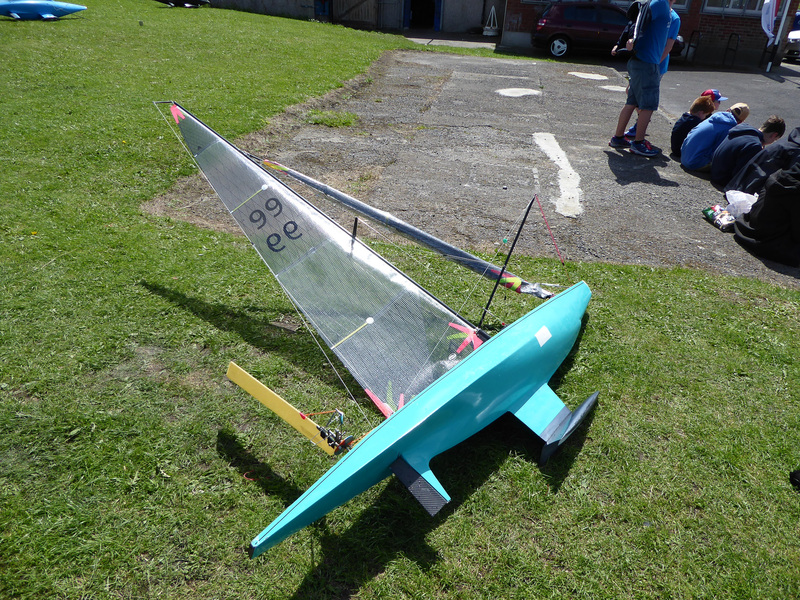 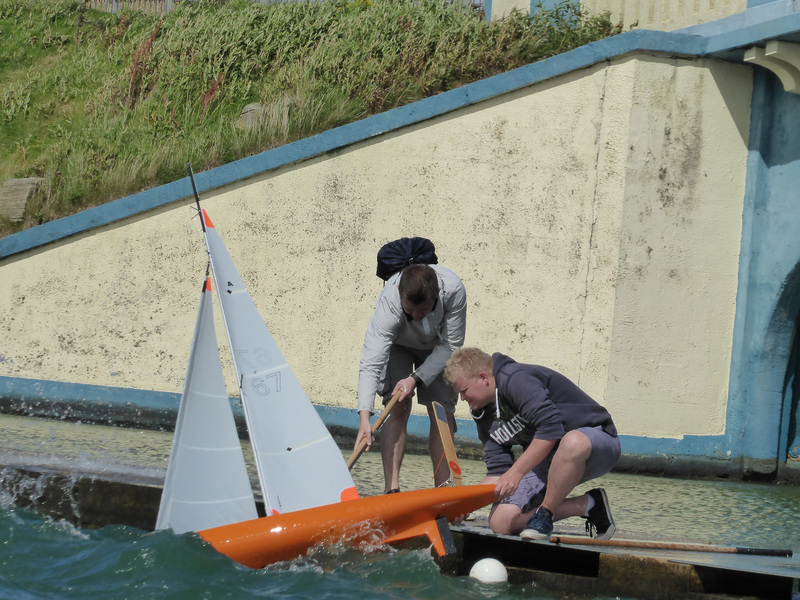 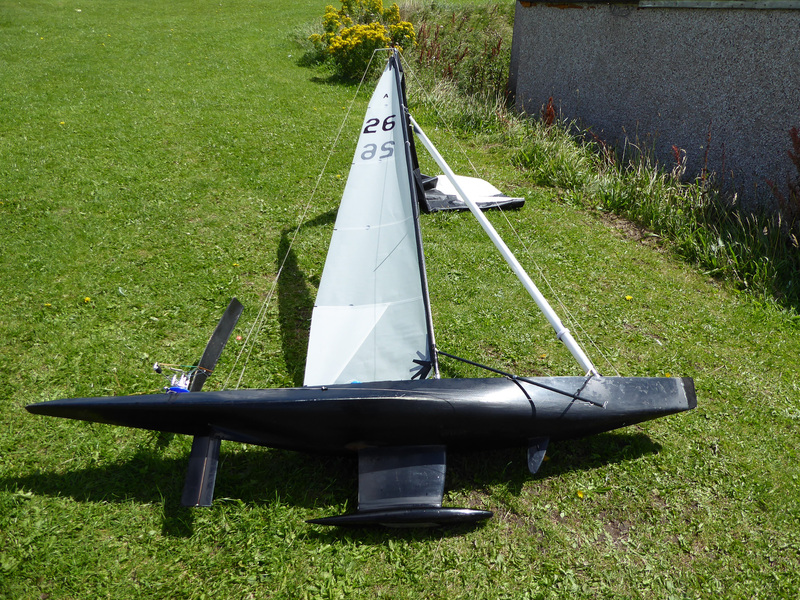 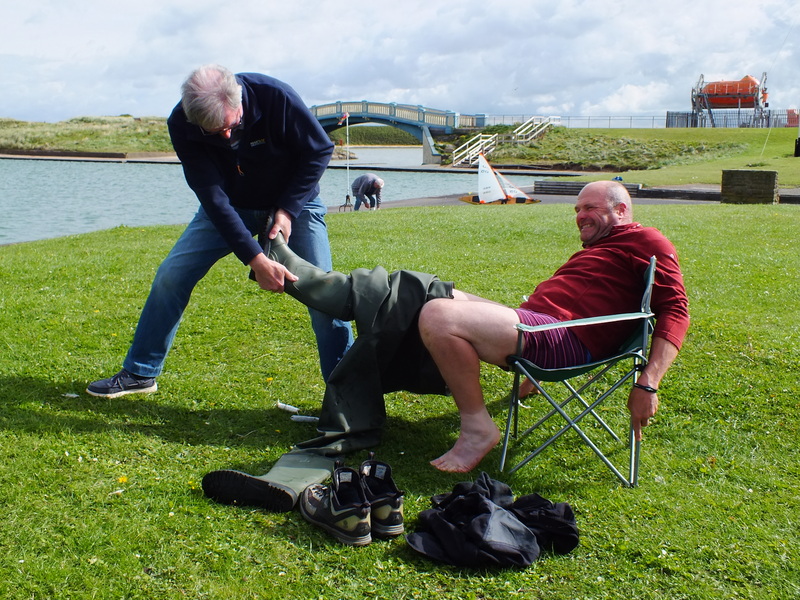 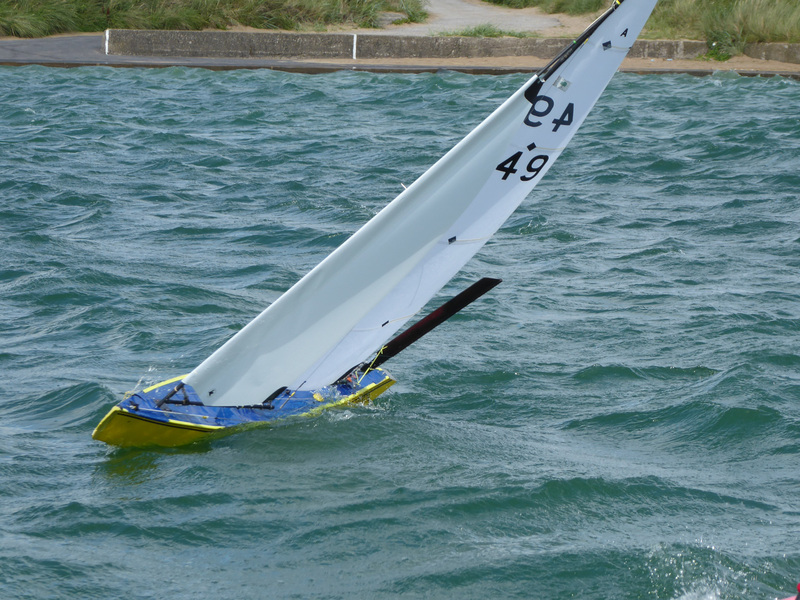 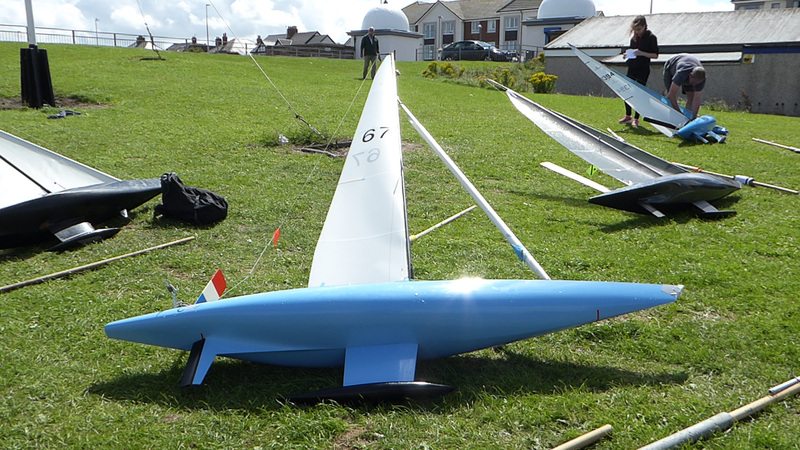 The Race Officer was Model Yachting Association and Fleetwood Club President, Derek Priestley, himself several times winner of the above trophies and also a World Champion in Radio Controlled “A” Class yachts. 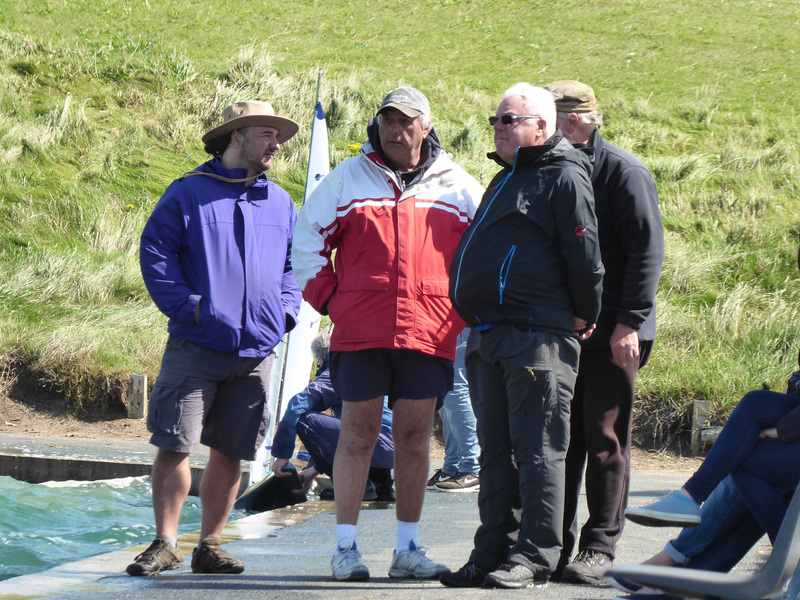 Eric Watkinson was the Scorer, and Line Judges and Starters John Plant, Brian Carruthers, Trevor Bell and David Rose. 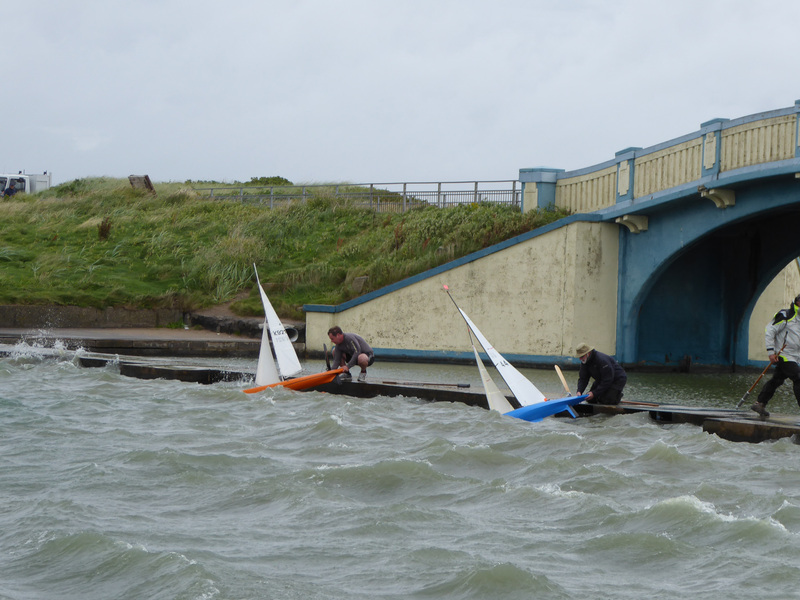 The weather conditions were a big test today as the wind gusted up to 35mph at times. 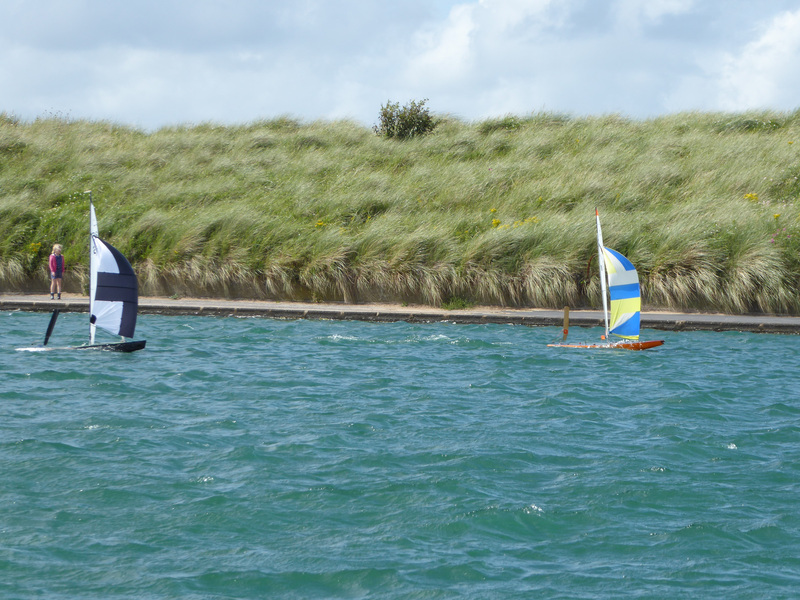 All skippers selected there smaller sails because of the wind conditions. 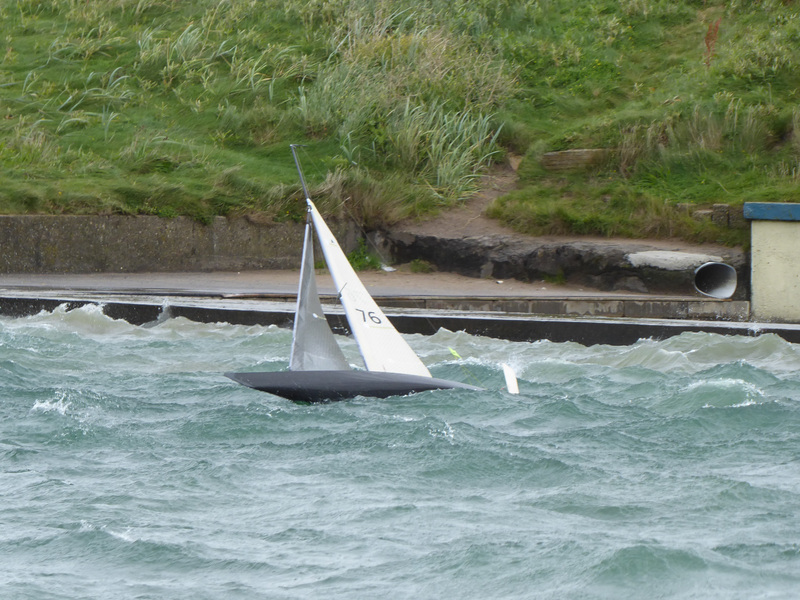 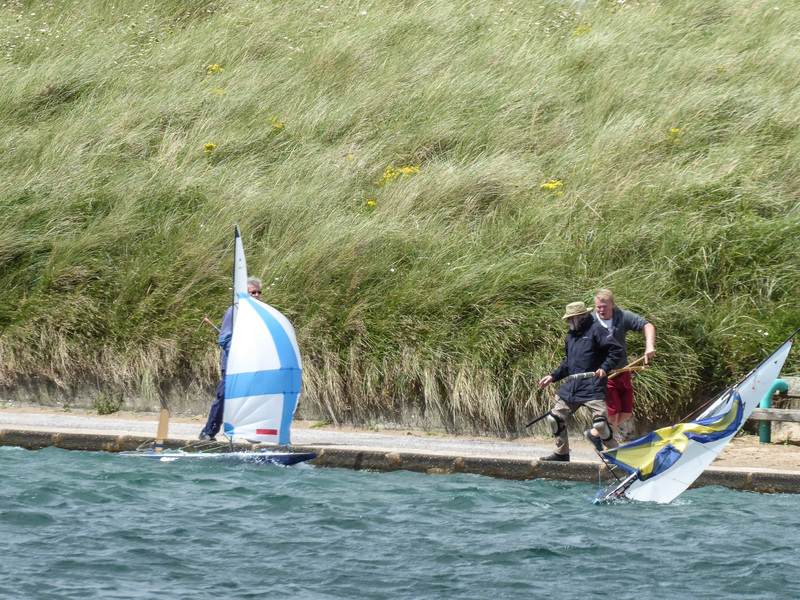 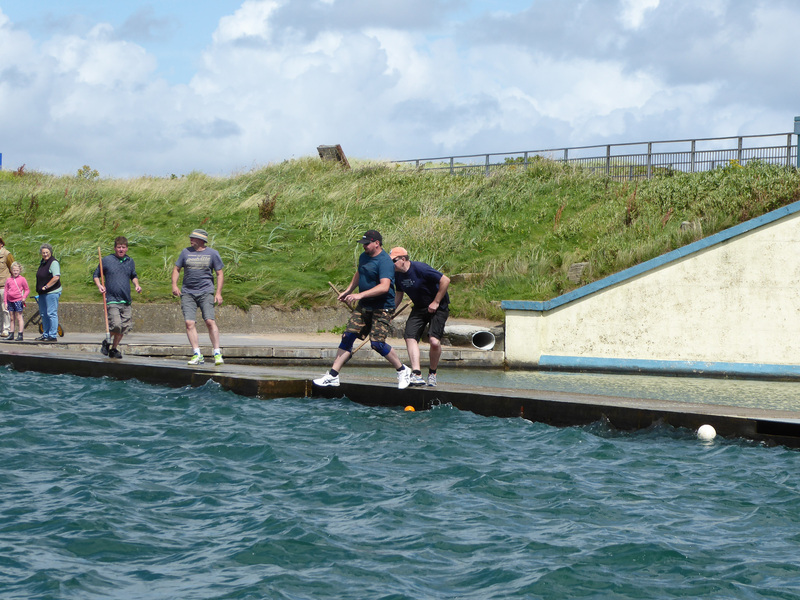 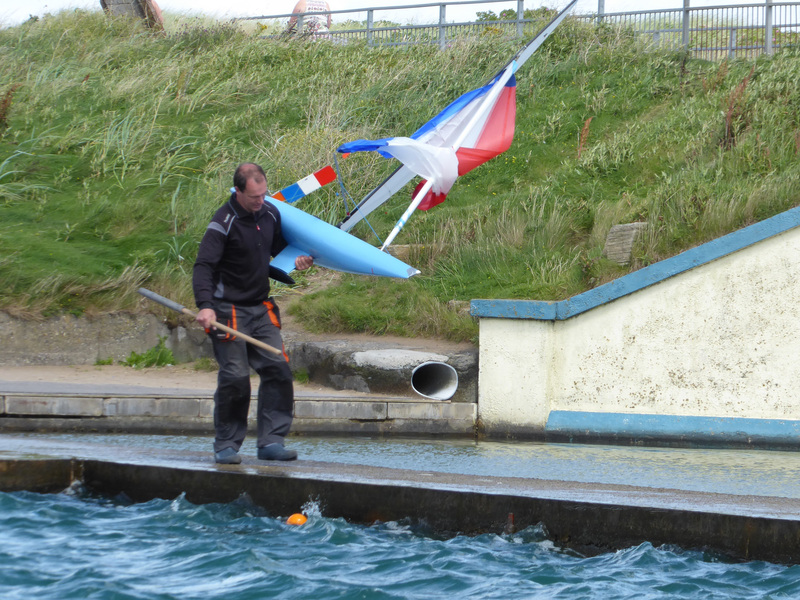 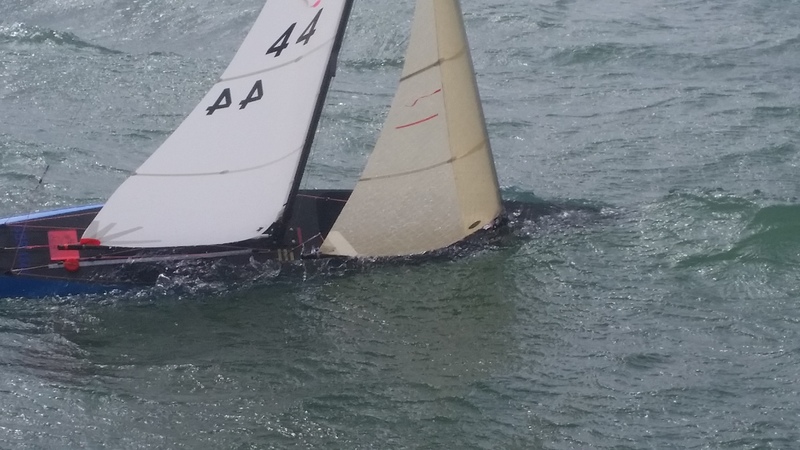 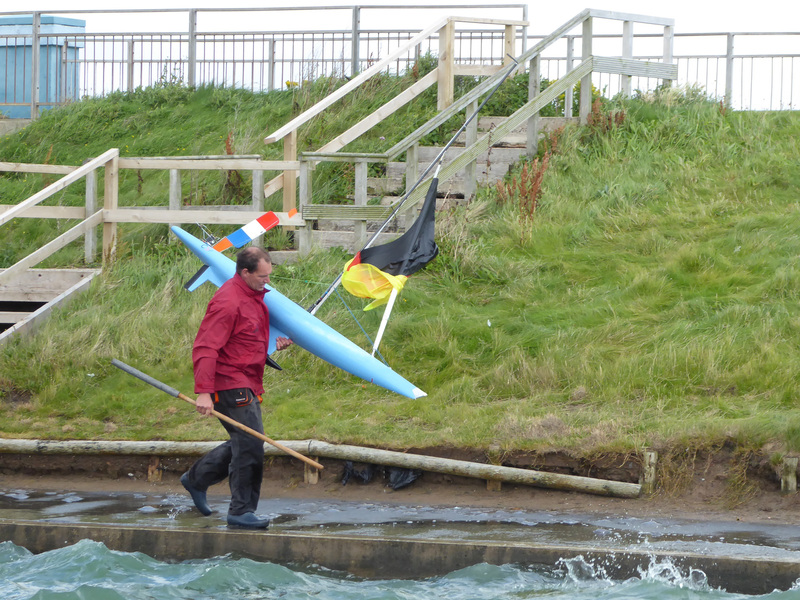 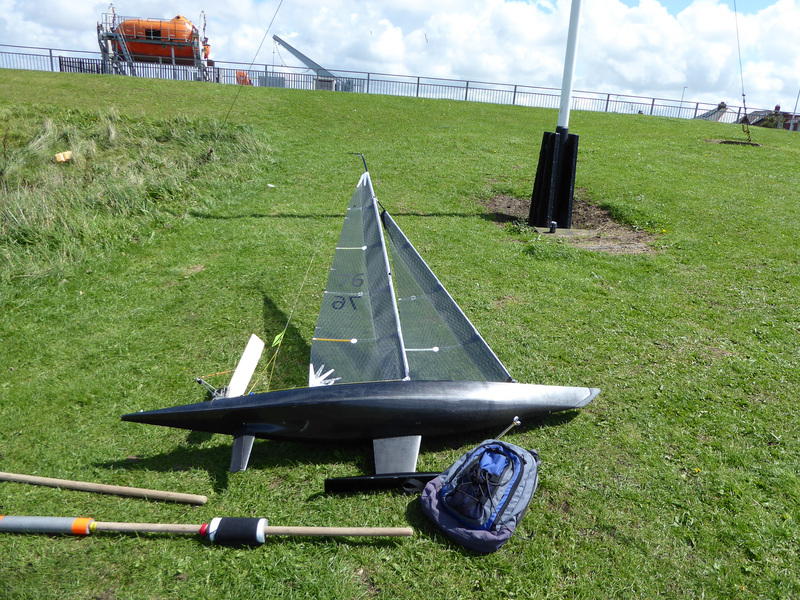 Only 4 heats were completed but to the skippers credit, only minor damage was done during todays racing. 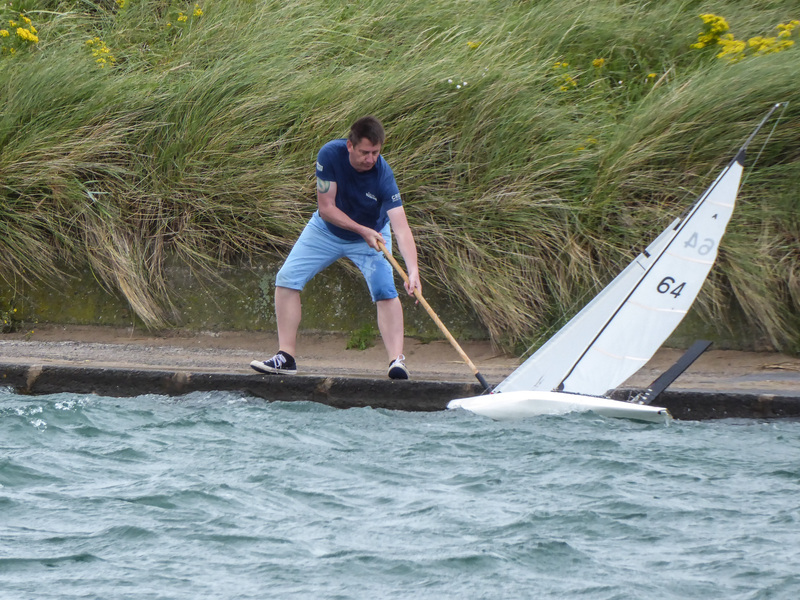 Its left some skippers having to complete some re-sails tomorrow. 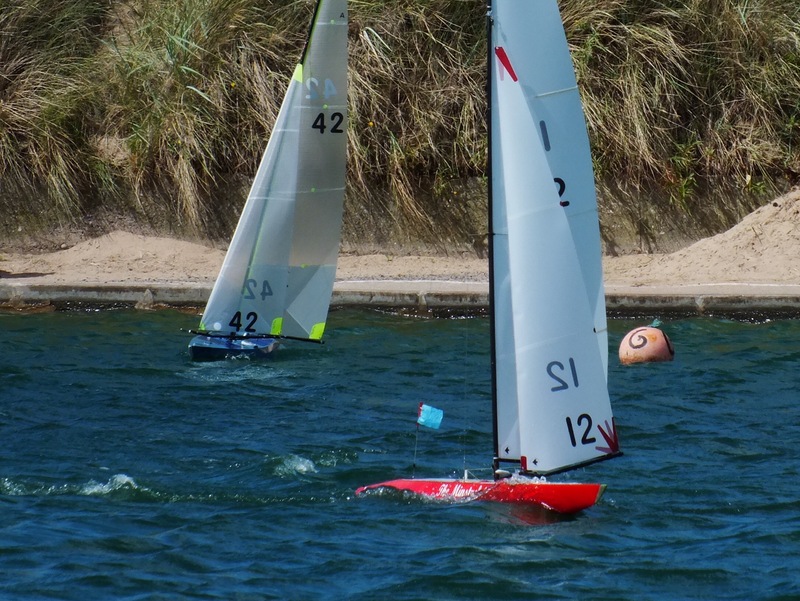 Overall there is no change at the top with David / Robert Bell, Martin Roberts / Bernie McNulty, Peter Whiteside and the Wyeth family all taking most of the points on offer. 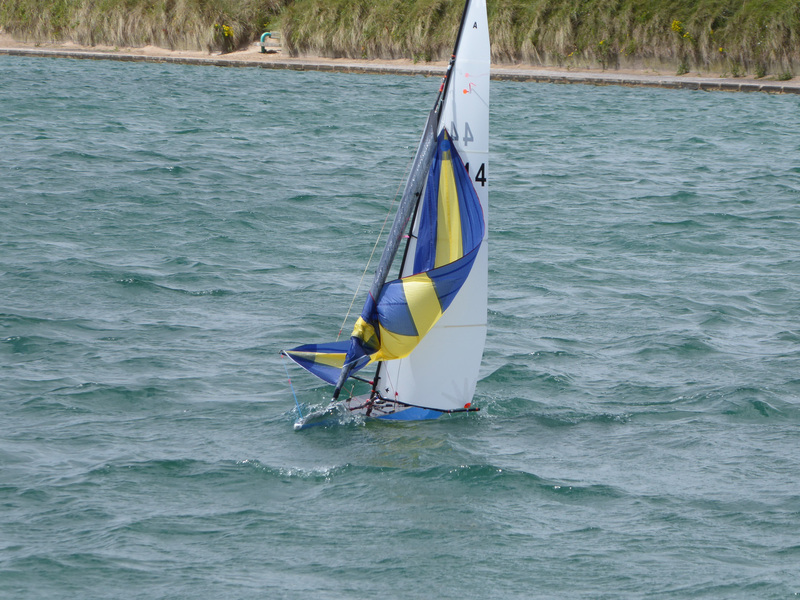 Tomorrow is the final day with it all to play for.